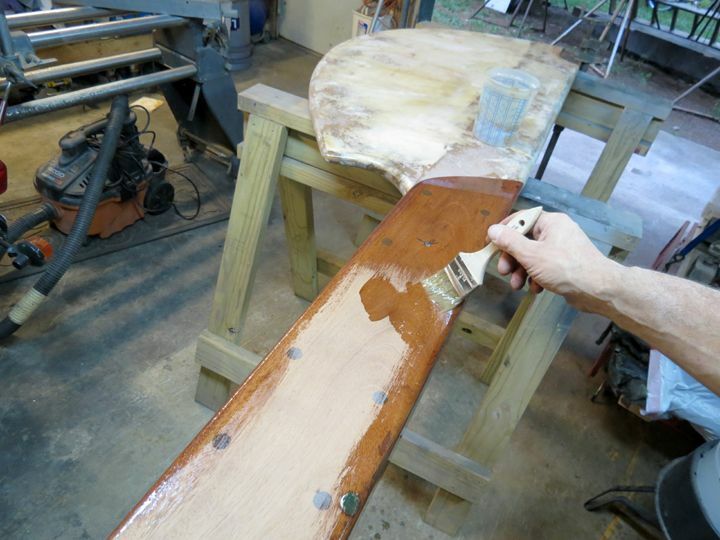 The documentation of the restoration process. 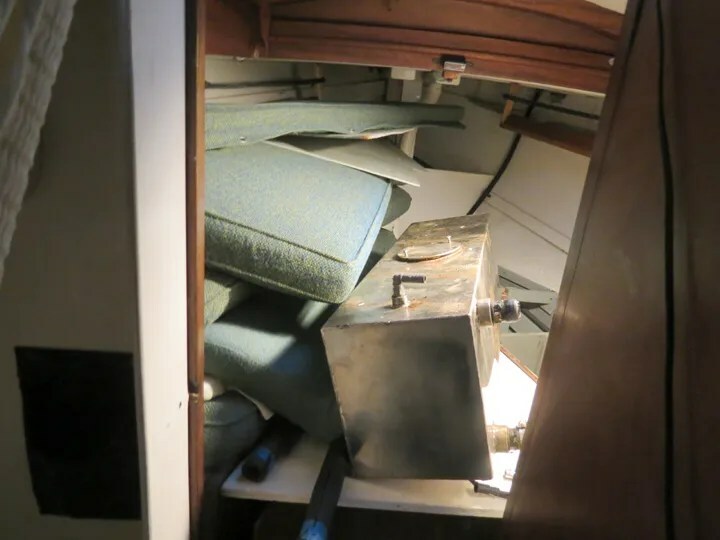 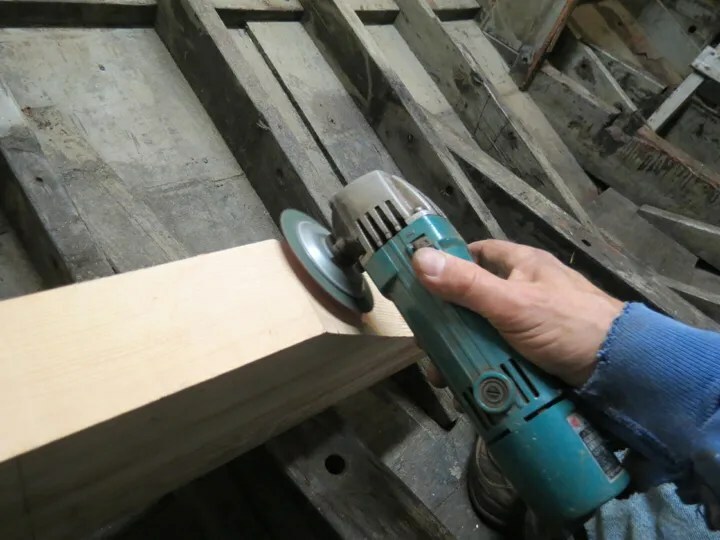 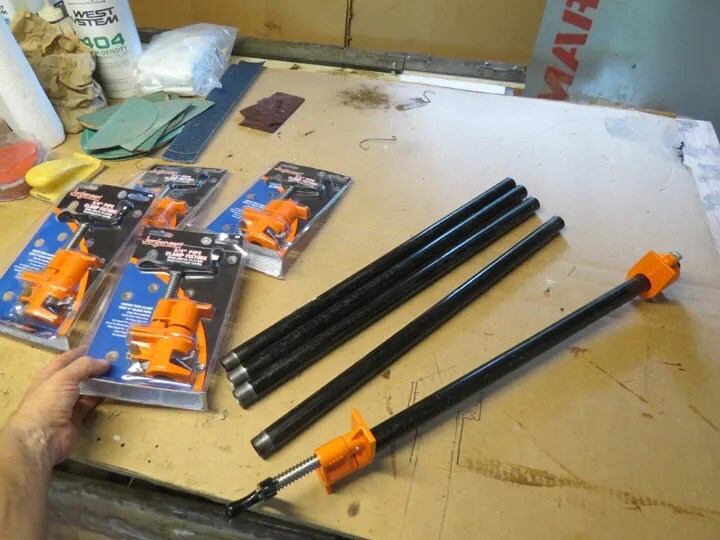 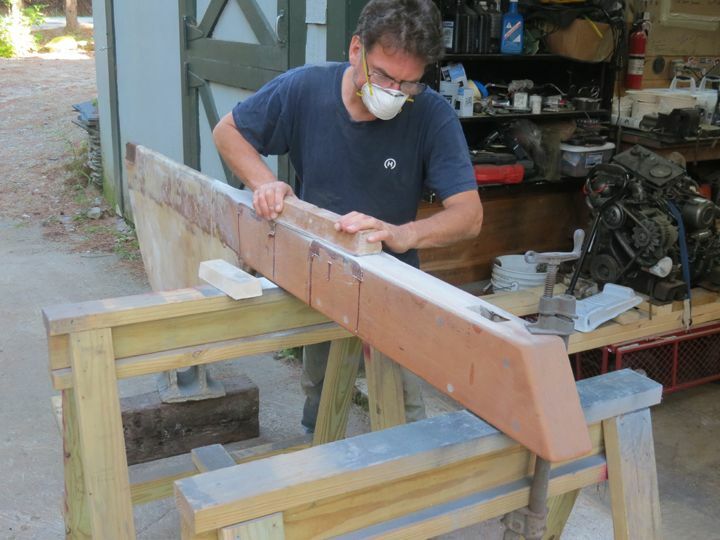 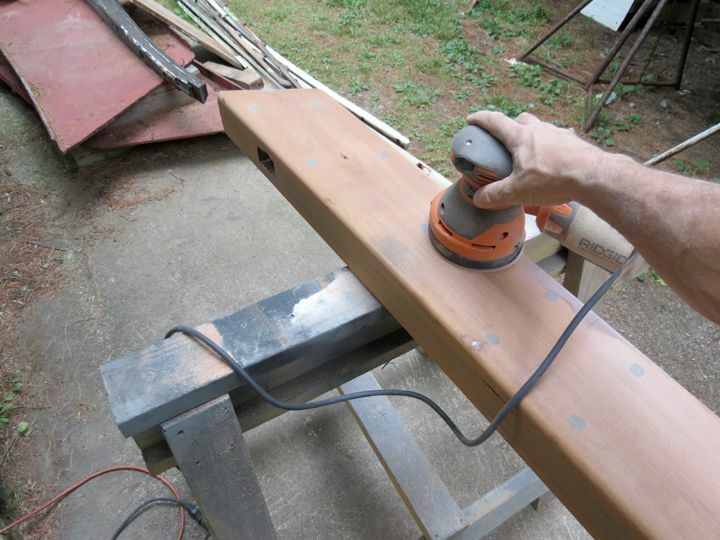 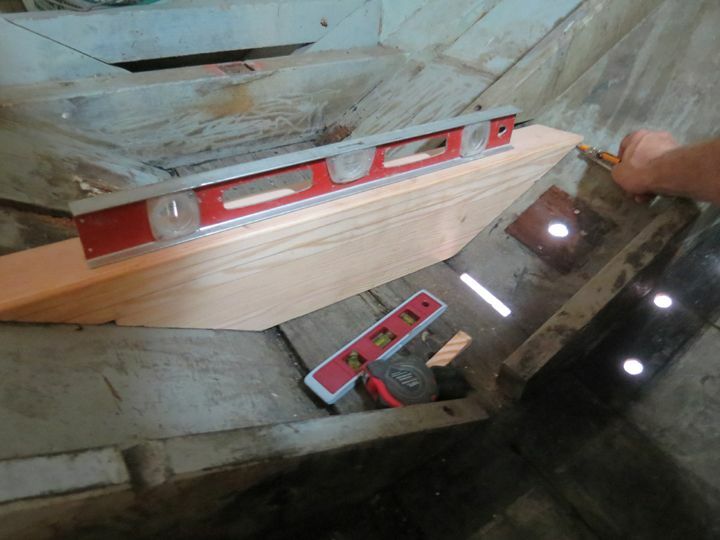 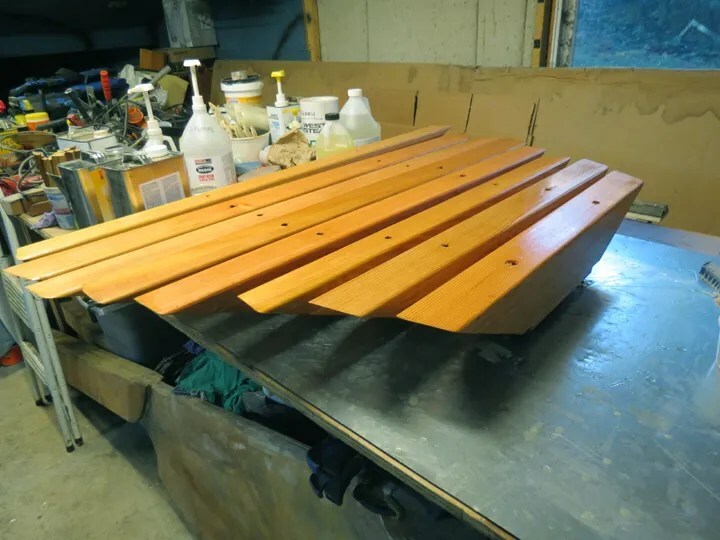 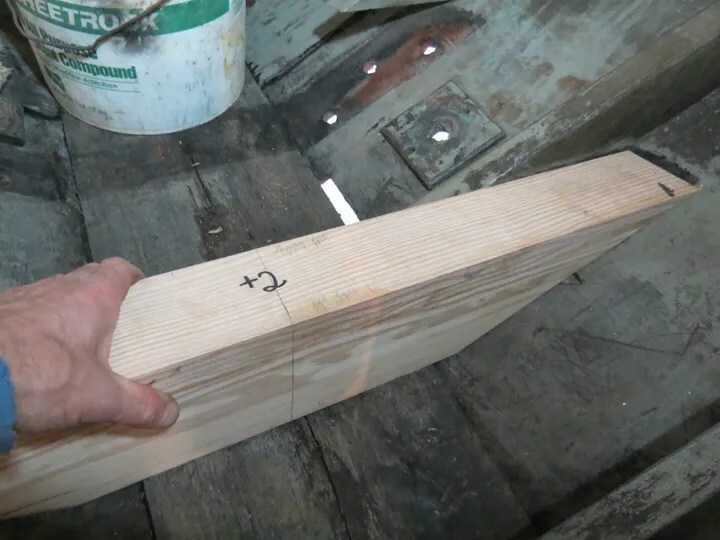 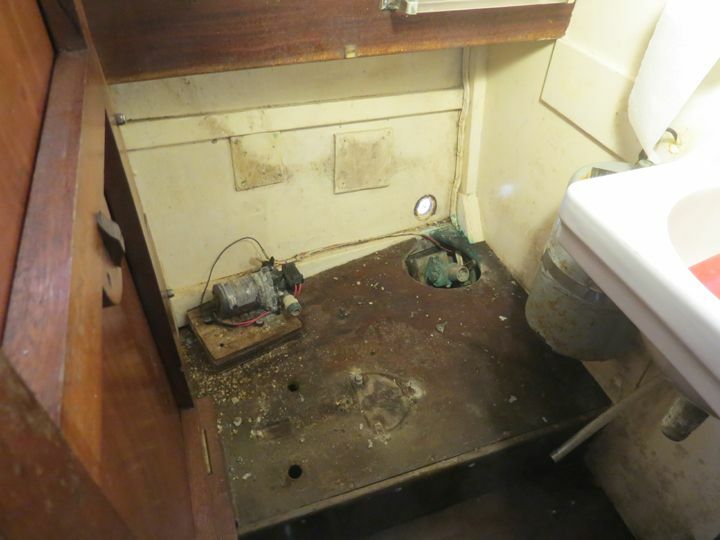 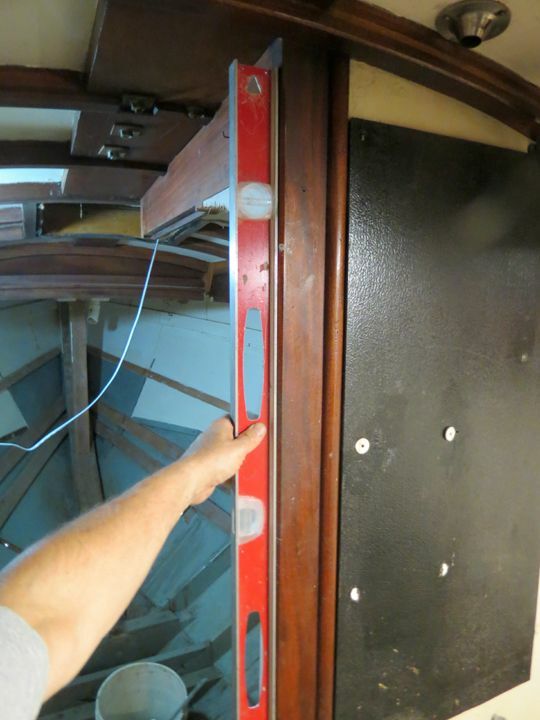 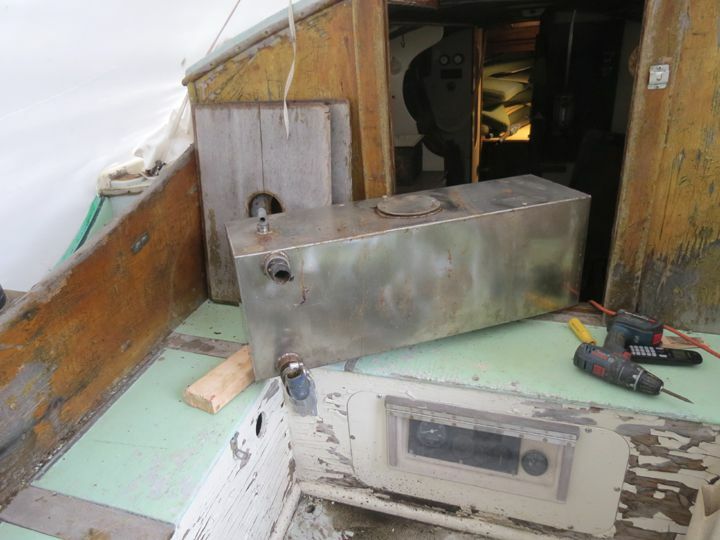 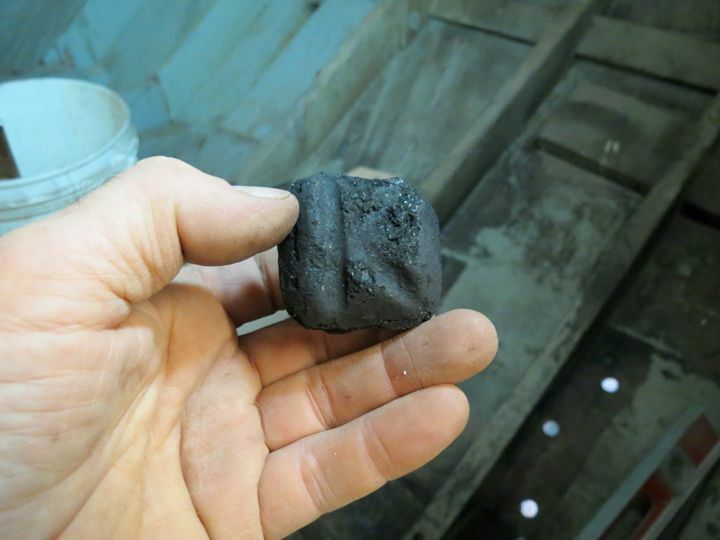 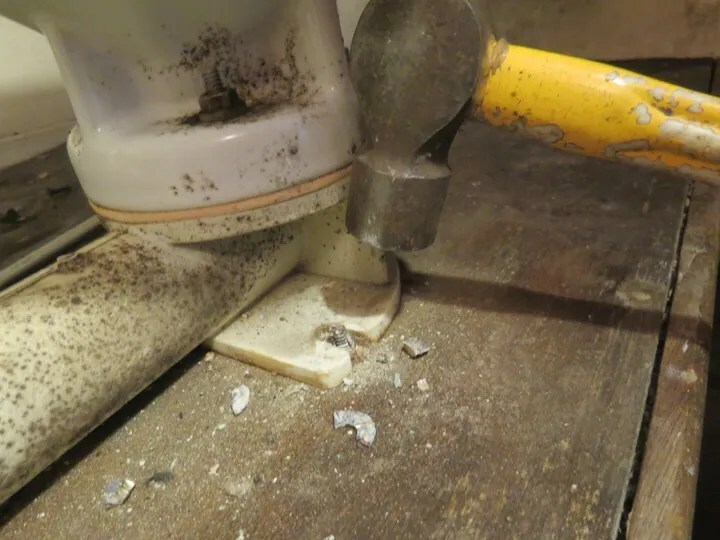 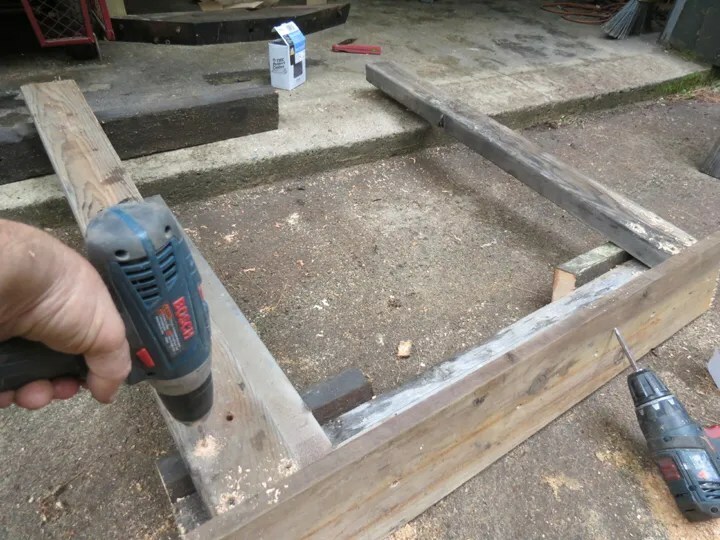 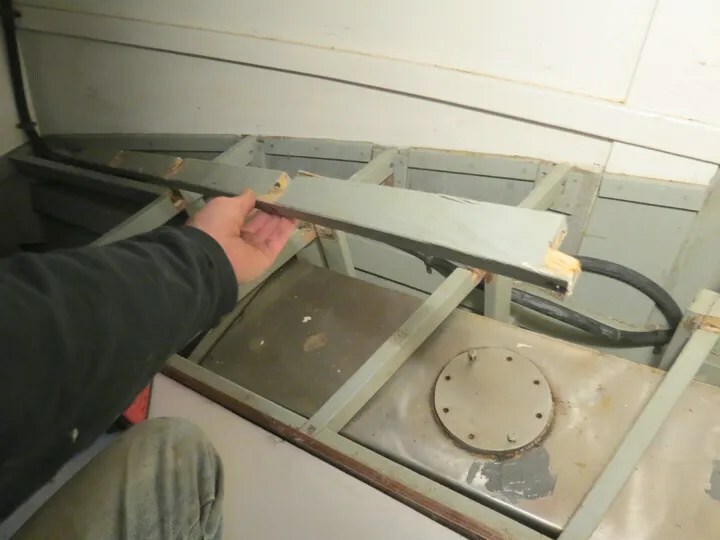 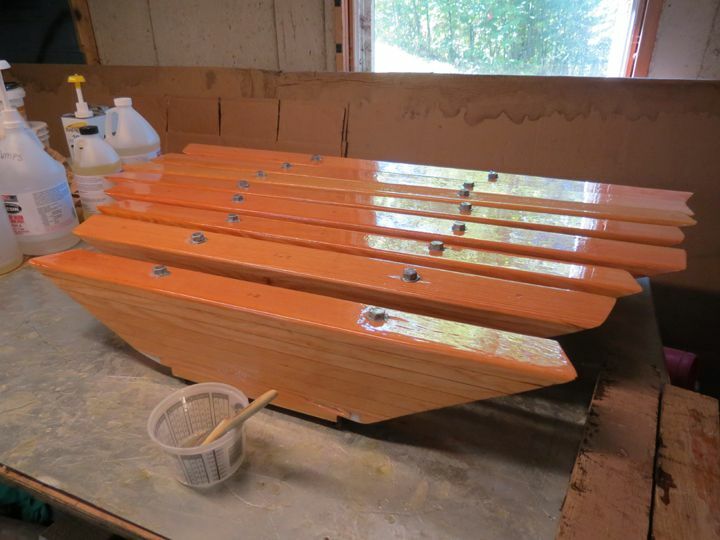 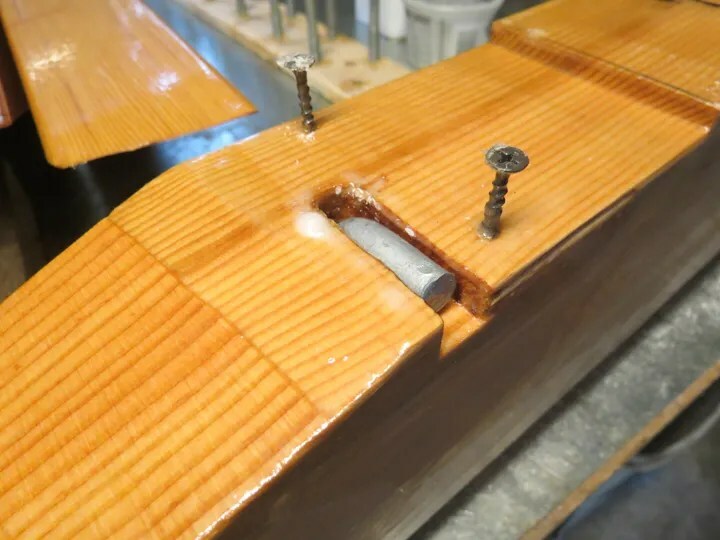 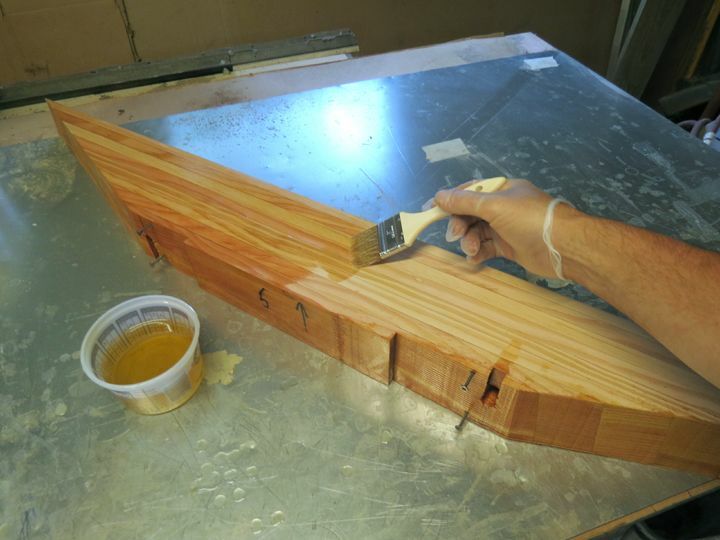 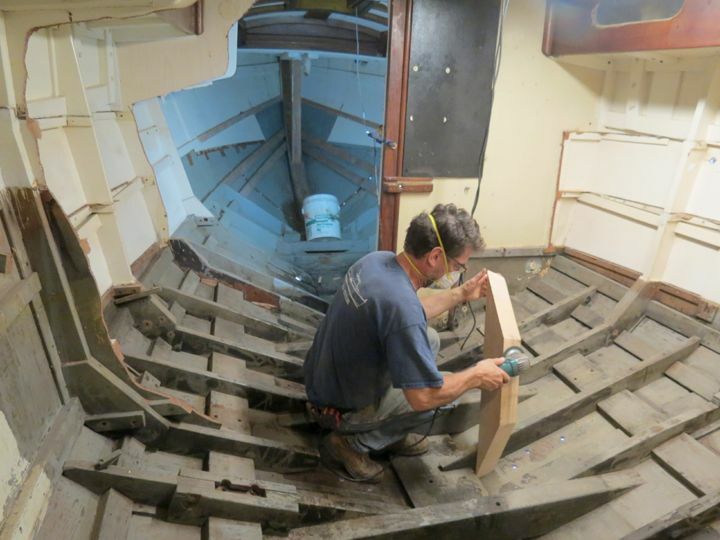 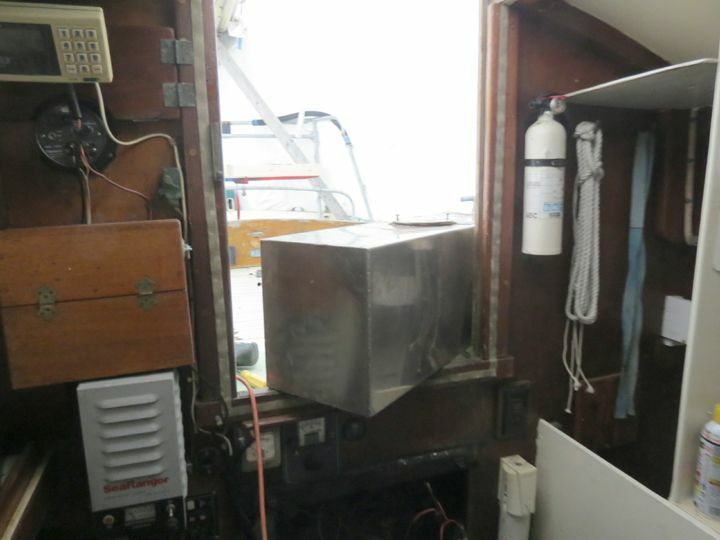 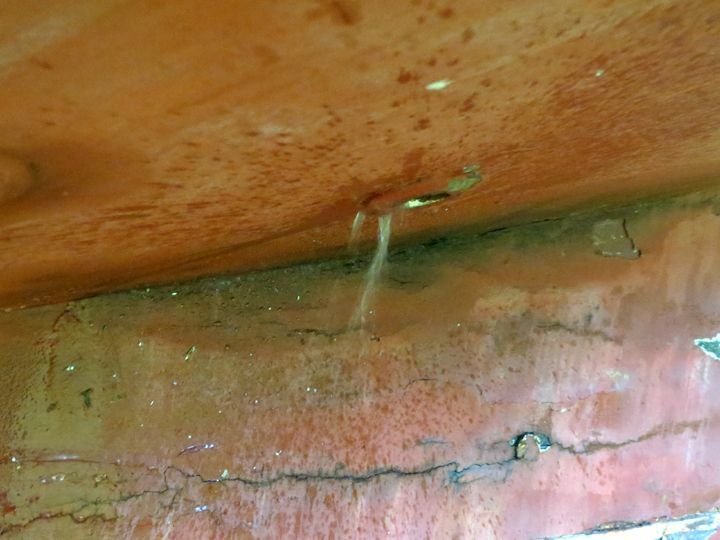 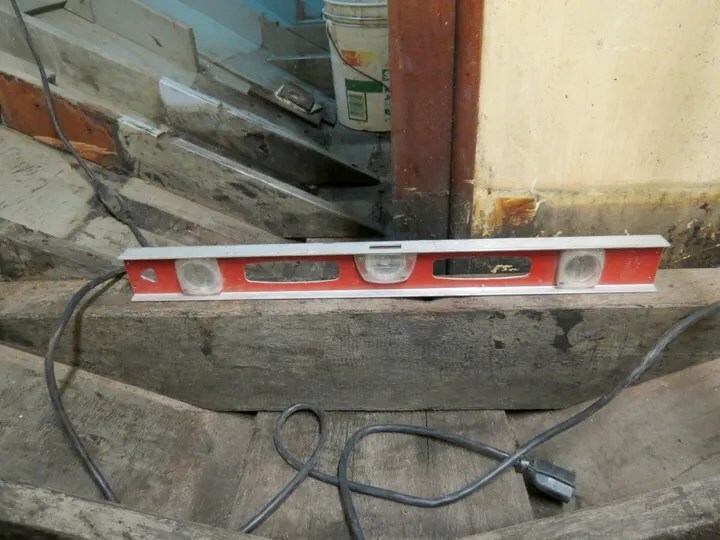 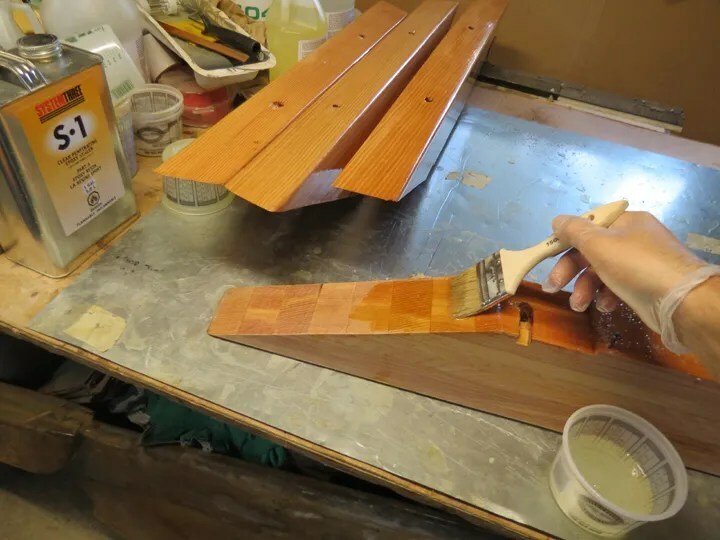 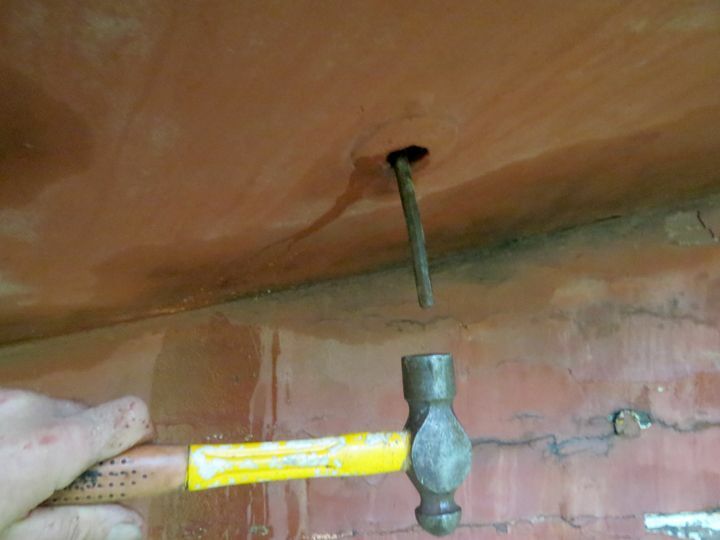 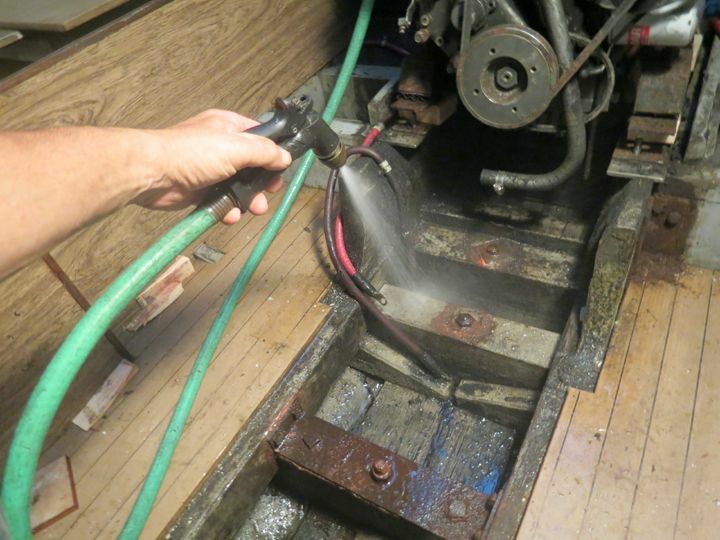 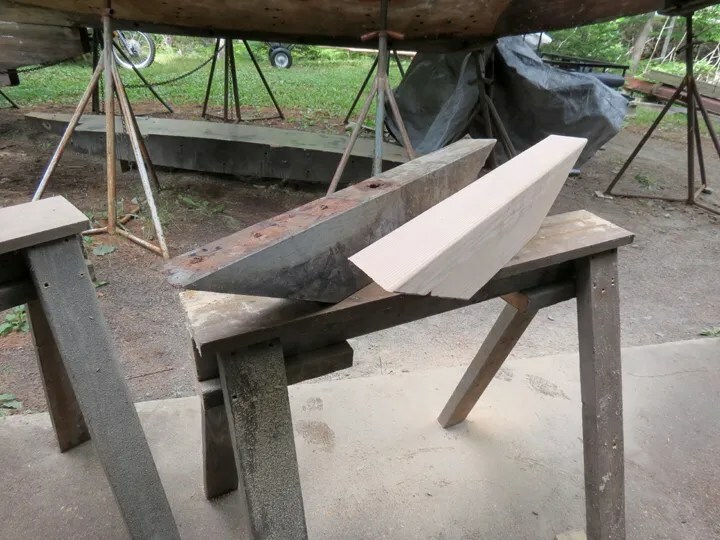 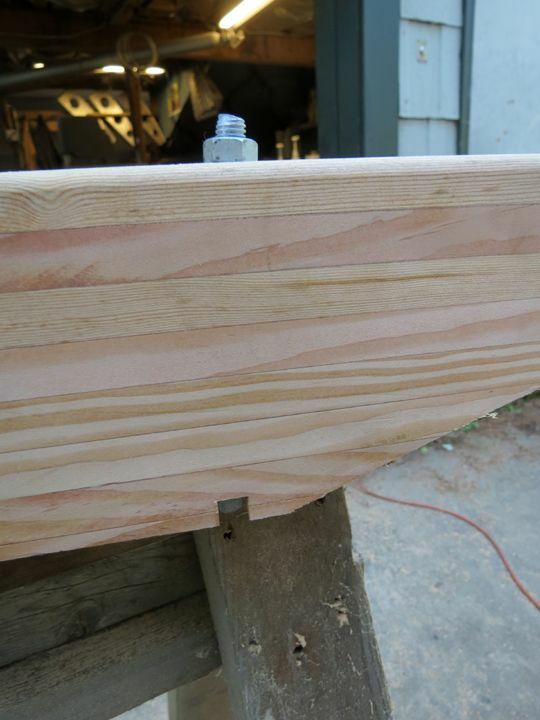 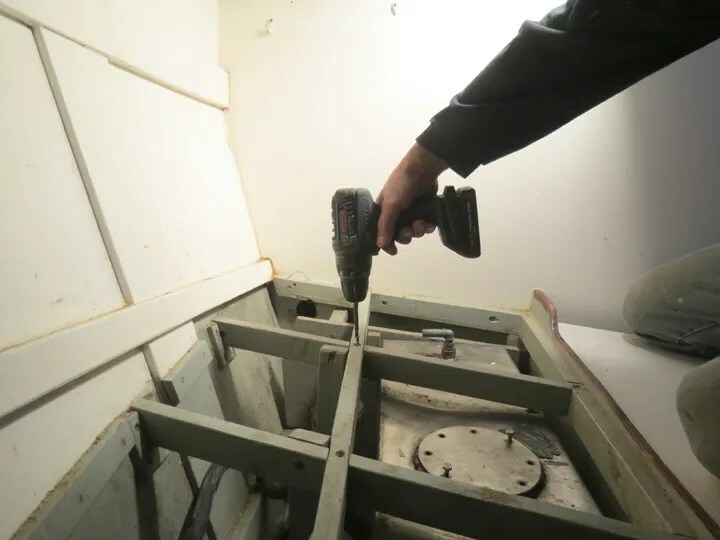 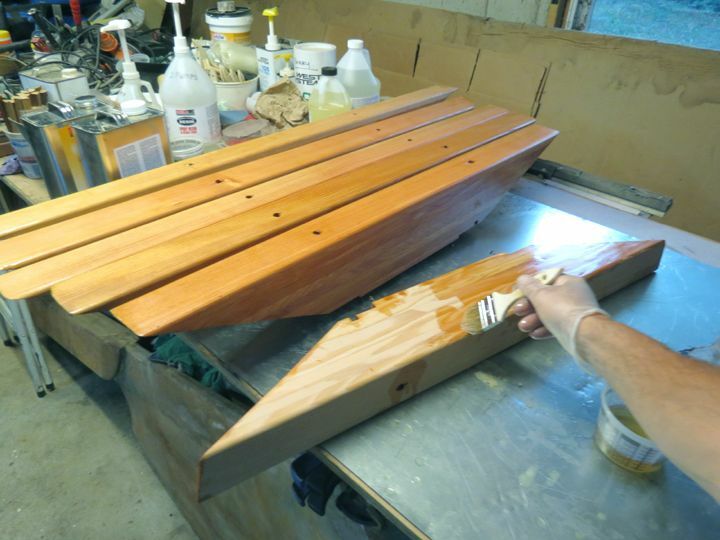 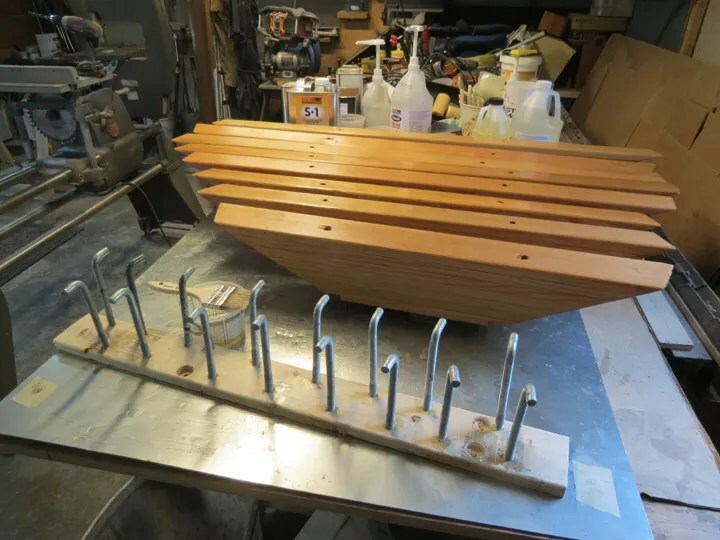 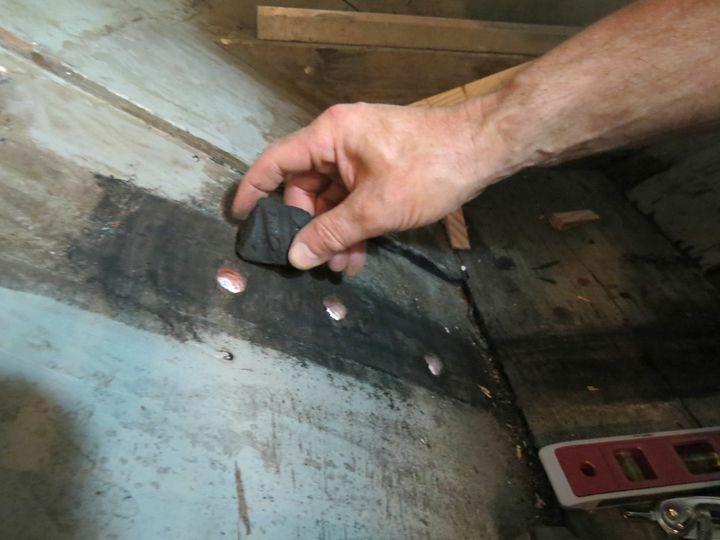 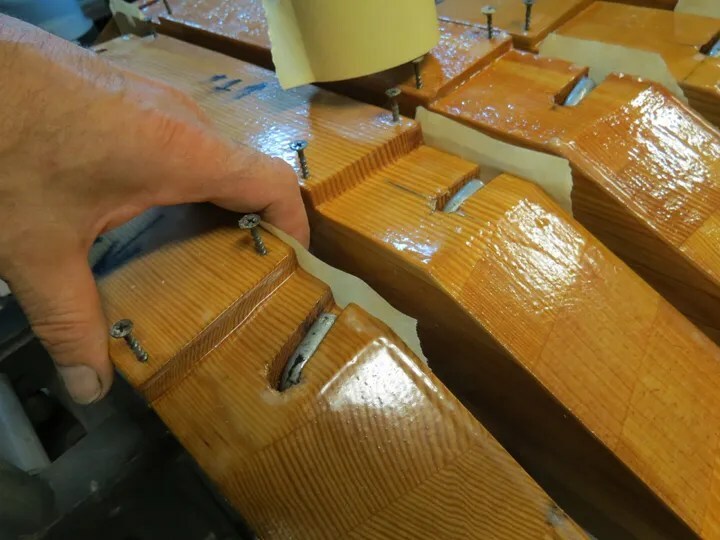 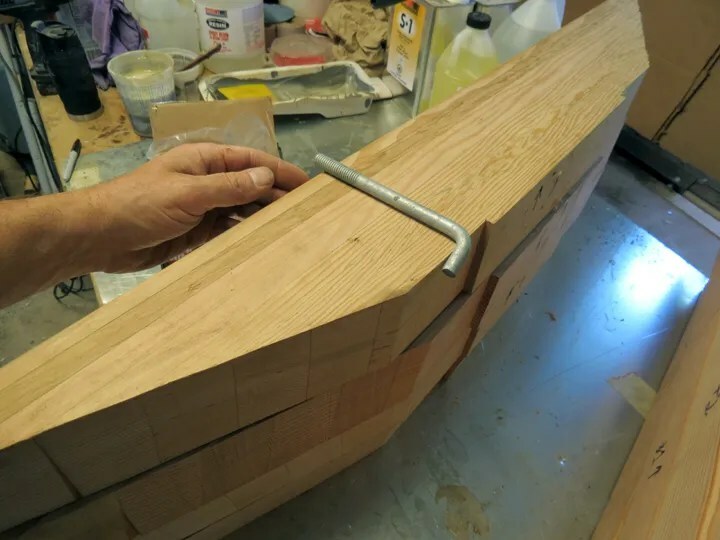 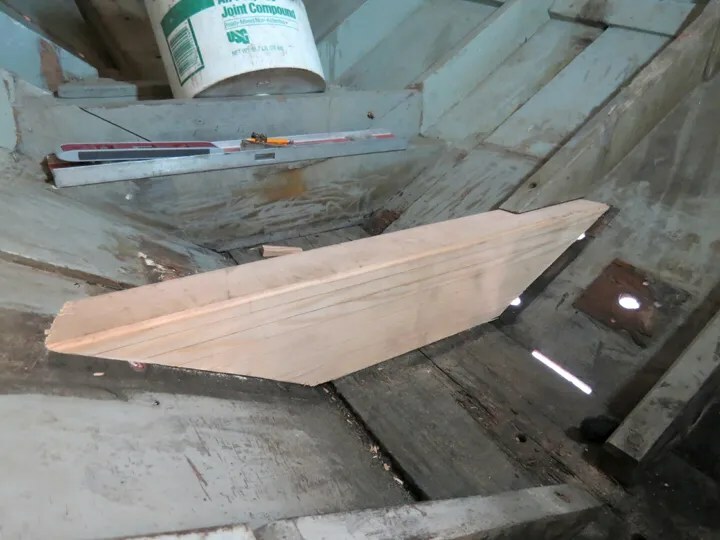 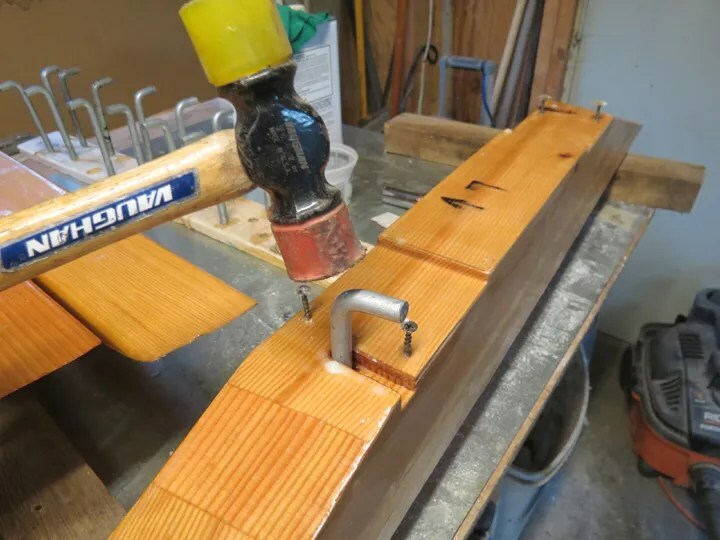 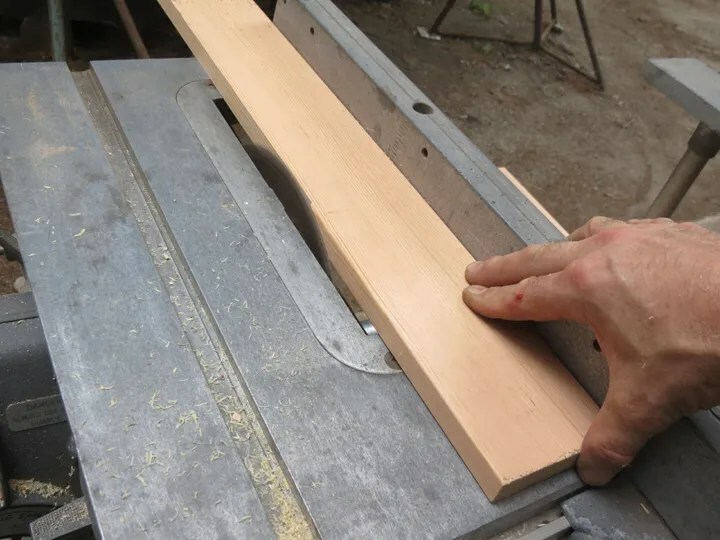 Once the Floor Timbers had been fit to the hull, and drilled and routed for the anchor bolts, I decided to try a new product to seal them up against moisture contamination. 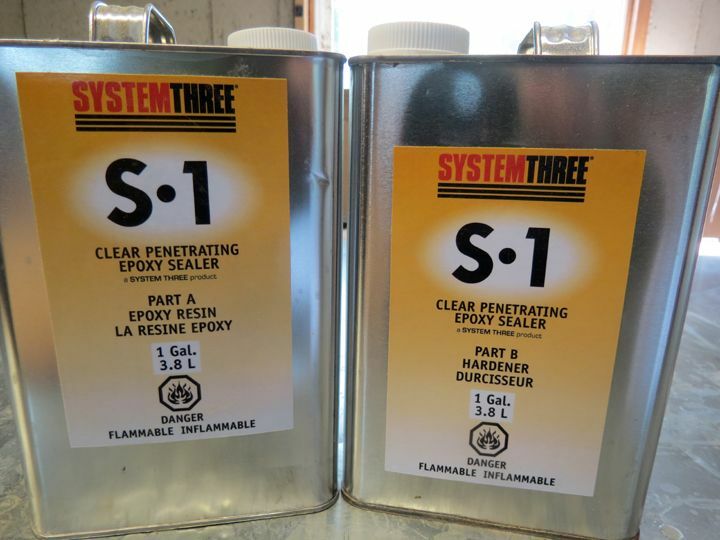 Because I have been working with System Three materials, I wanted to continue with that manufacturer’s group of epoxy products. 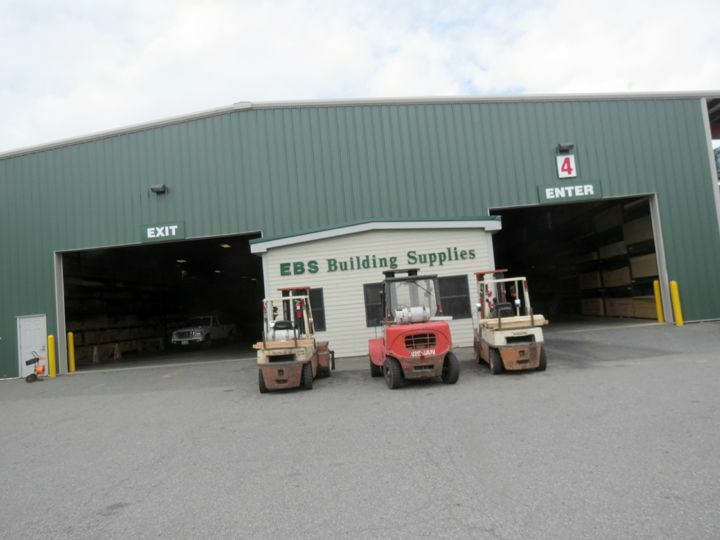 They have a product that falls under the acronym: CPES. 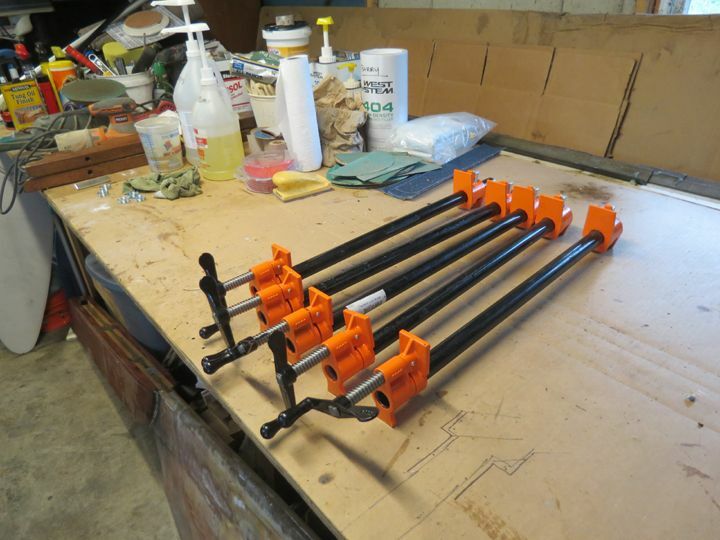 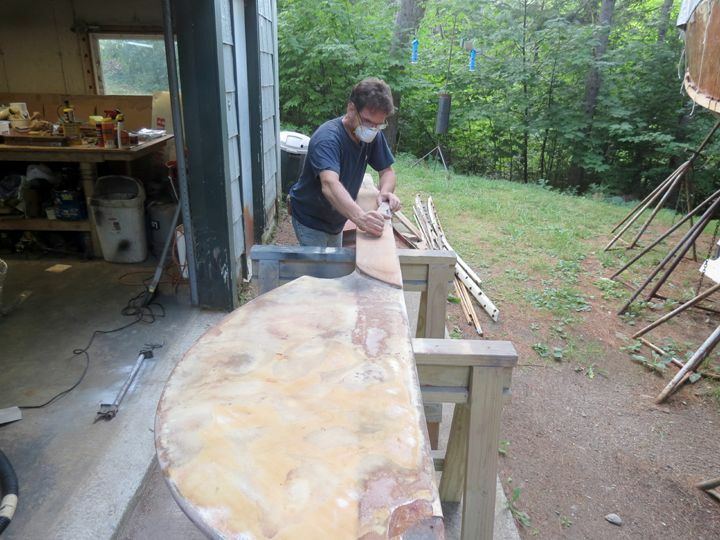 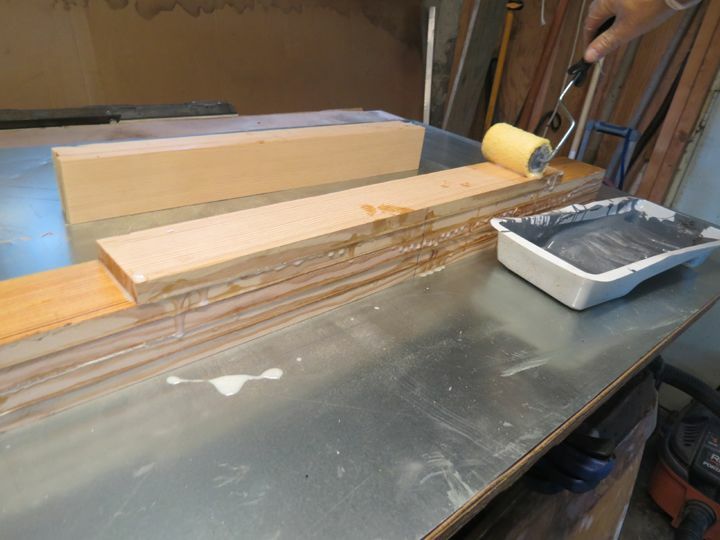 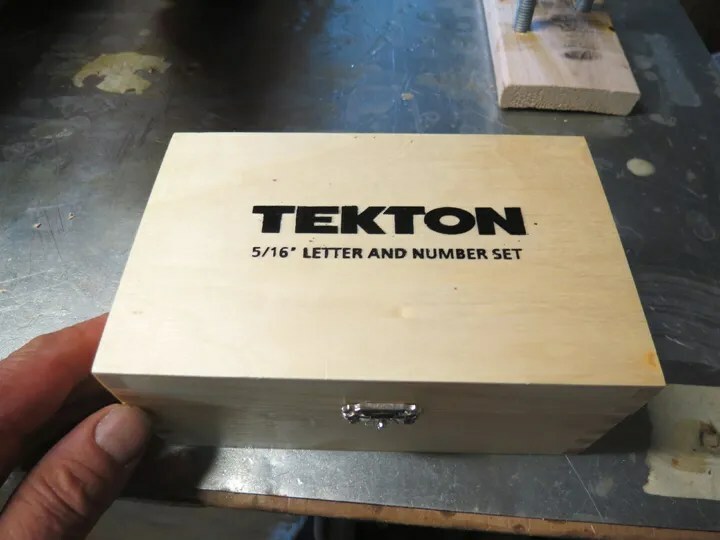 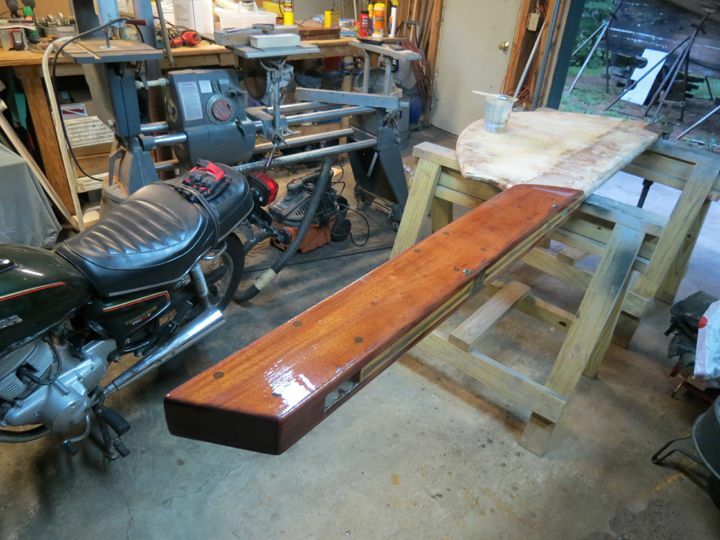 The acronym of those four letters stand for: Clear, Penetrating, Epoxy, Sealer. 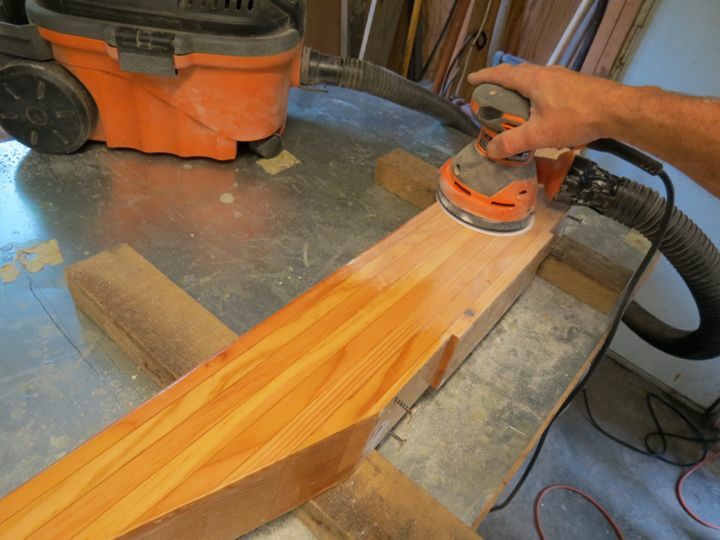 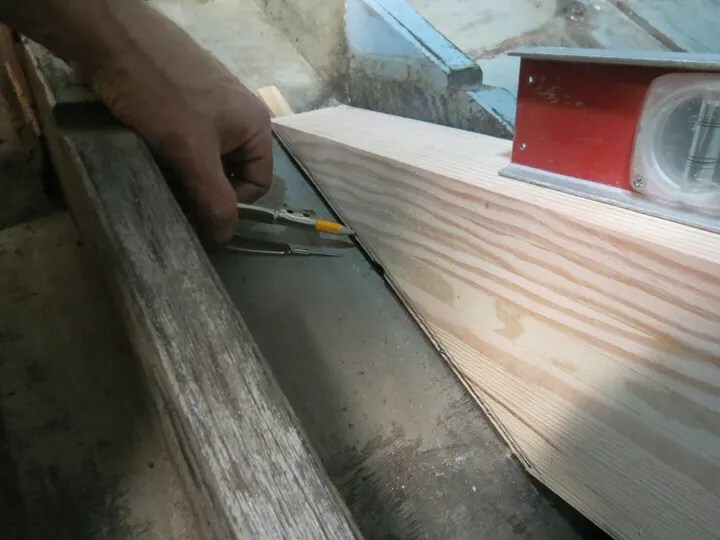 To prepare the Floor Timbers for sealing, using my palm-sander, (And 60 grit sandpaper. 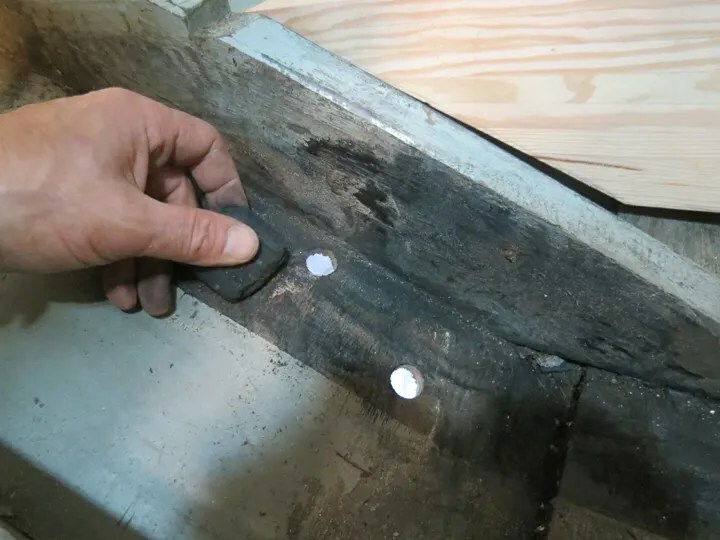 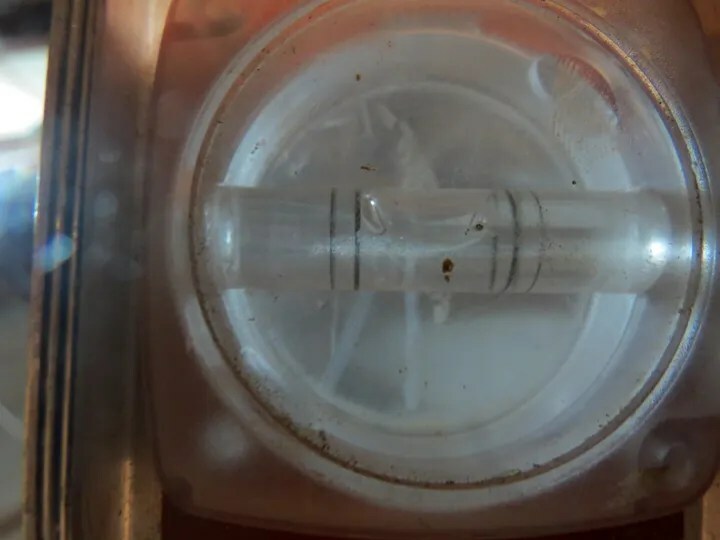 ), I “scuffed” all of the surfaces to remove any contaminates and to provide “tooth” for the System Three CPES to bond to. 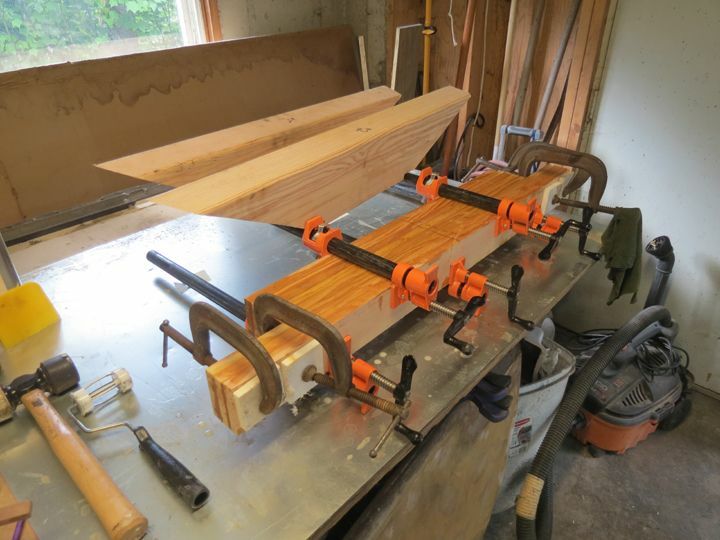 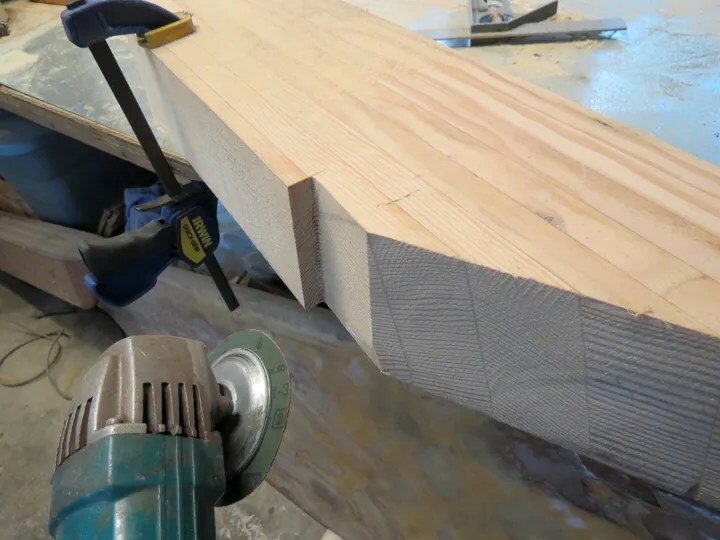 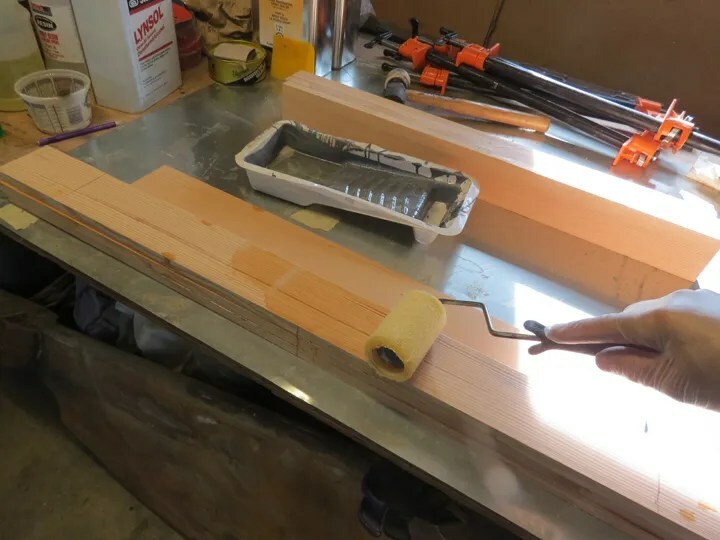 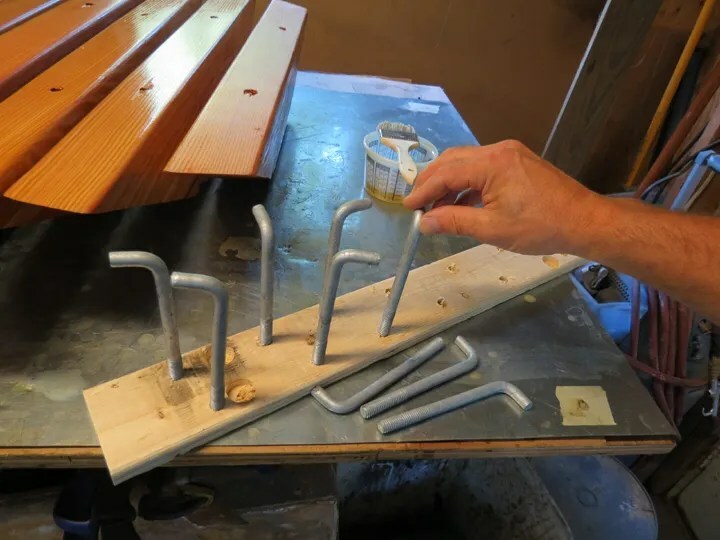 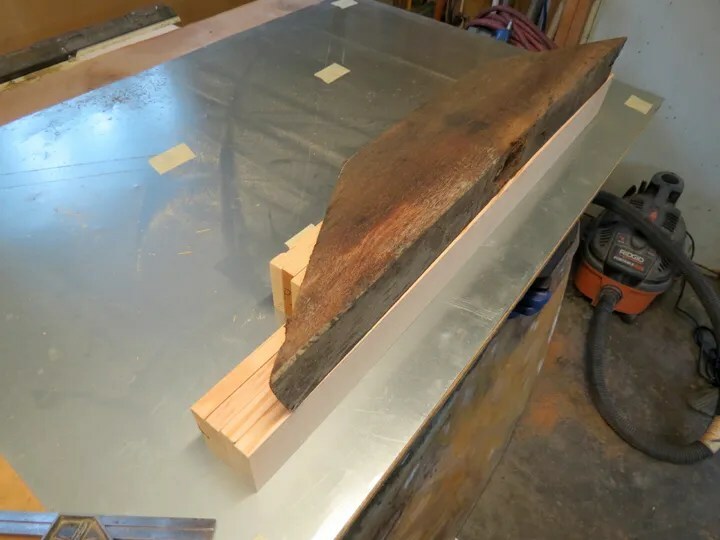 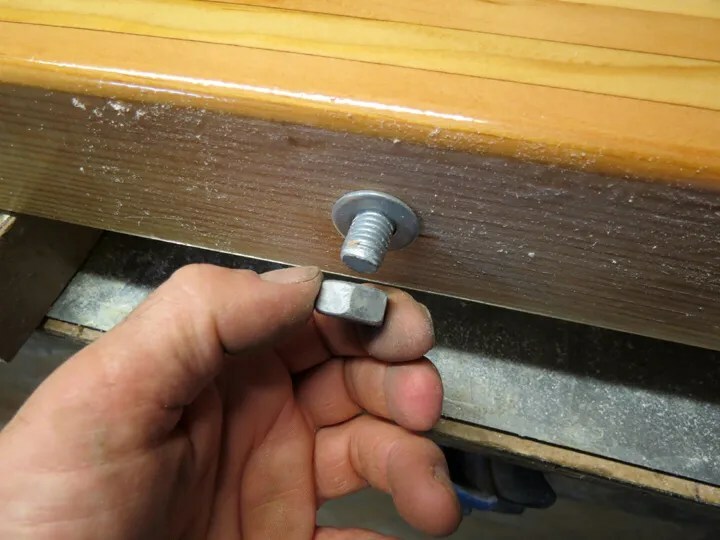 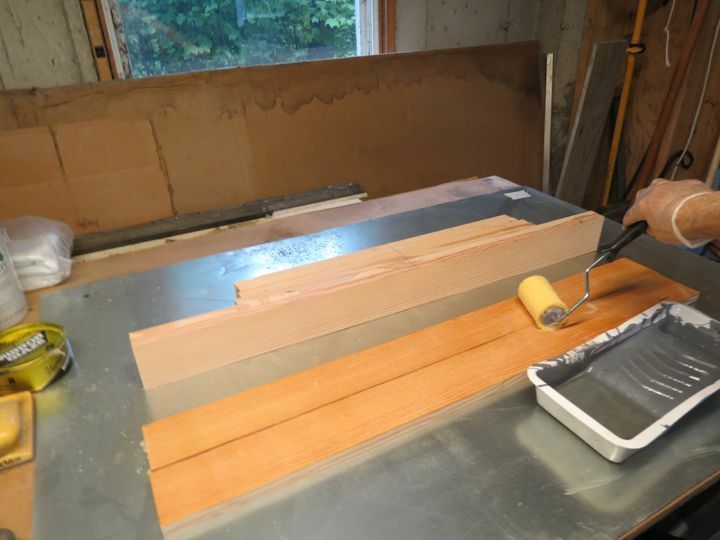 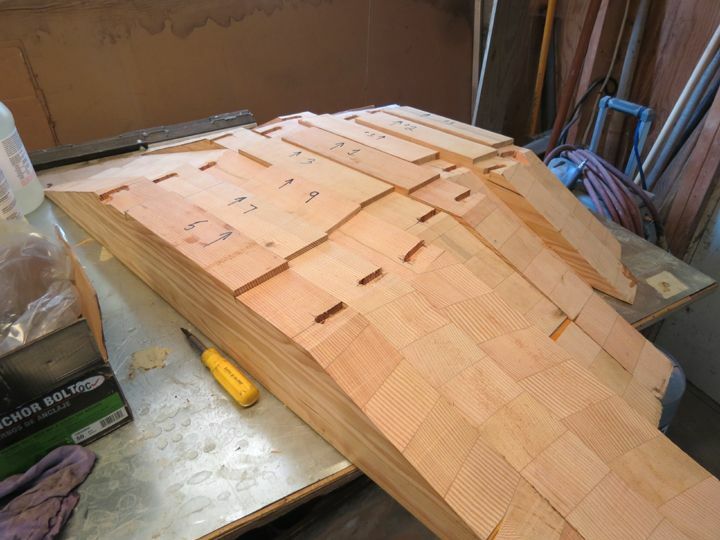 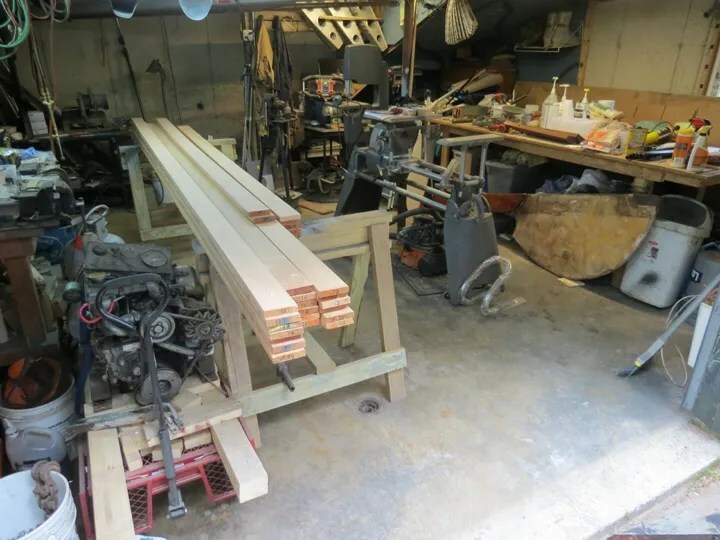 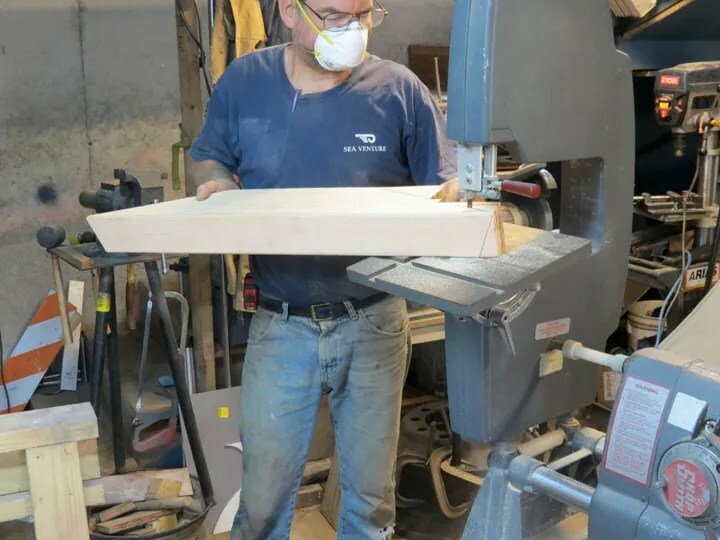 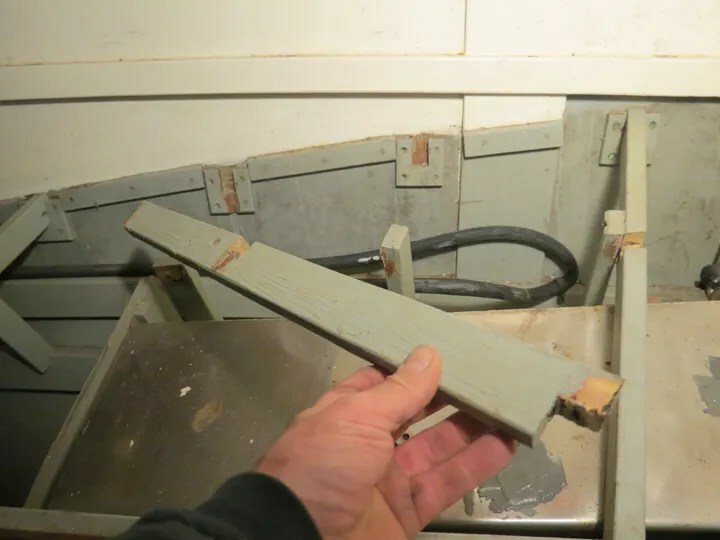 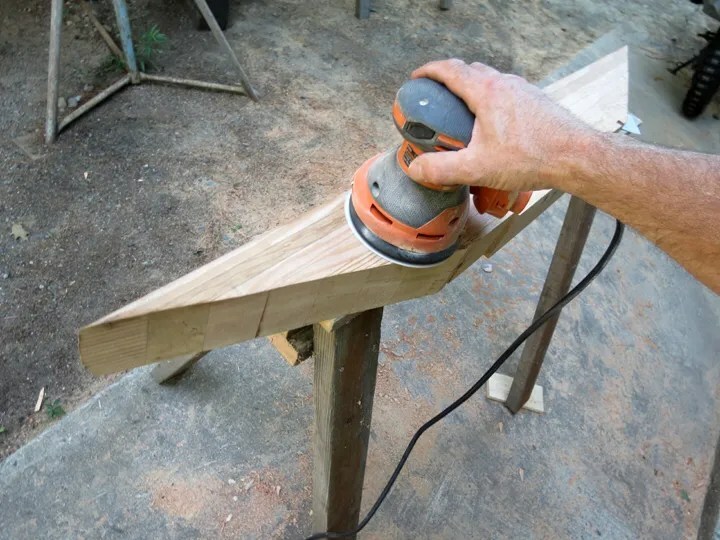 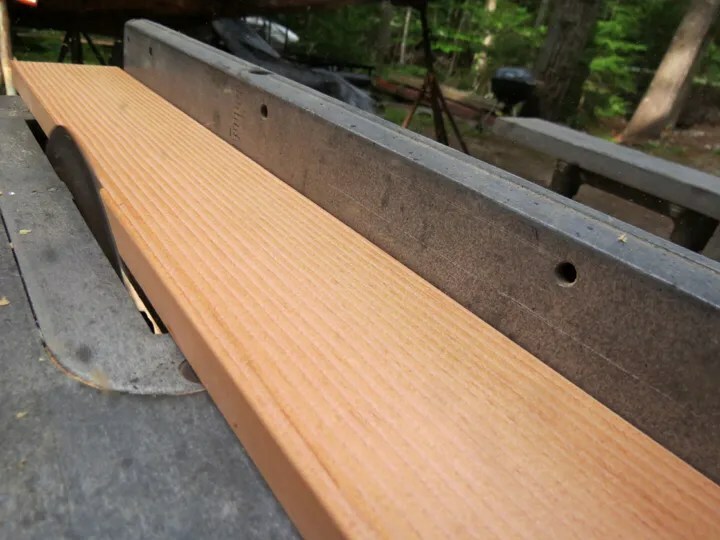 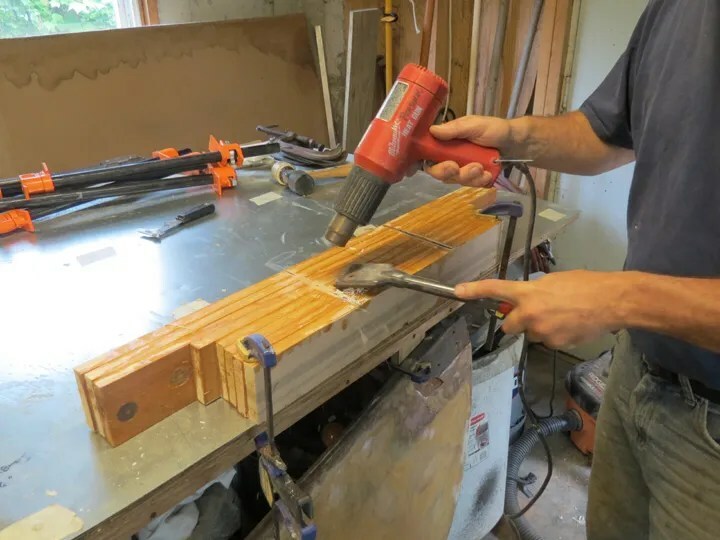 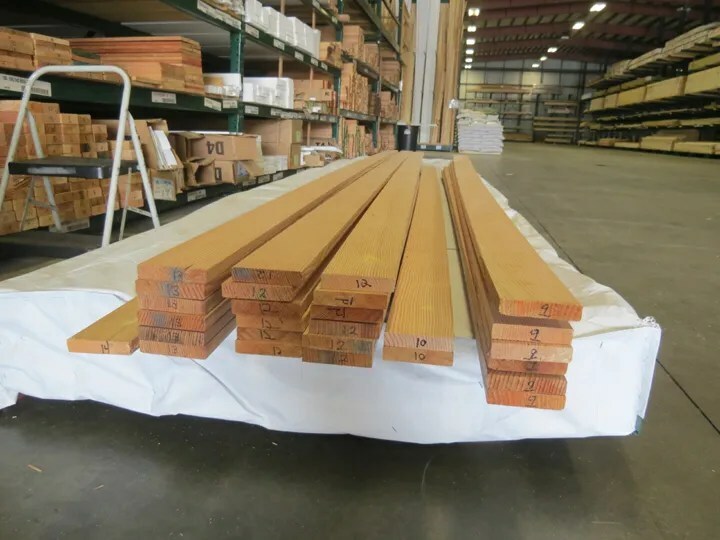 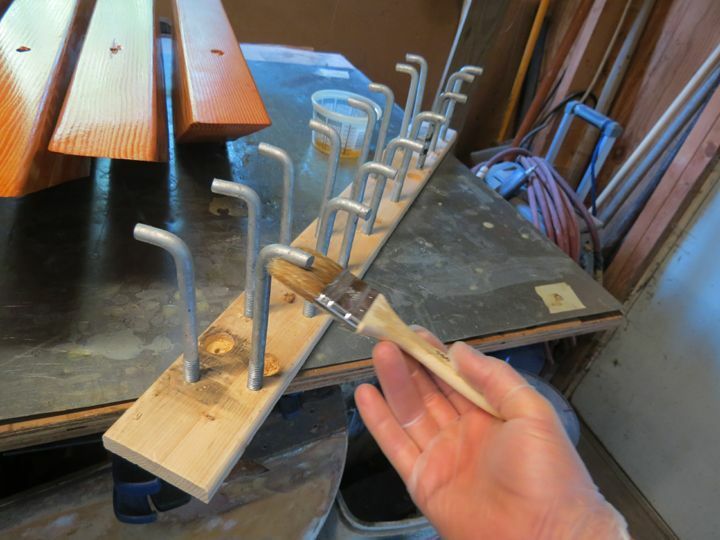 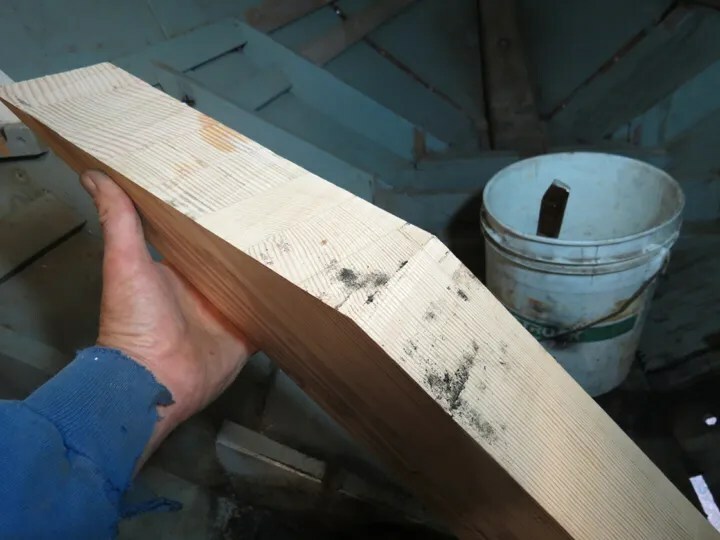 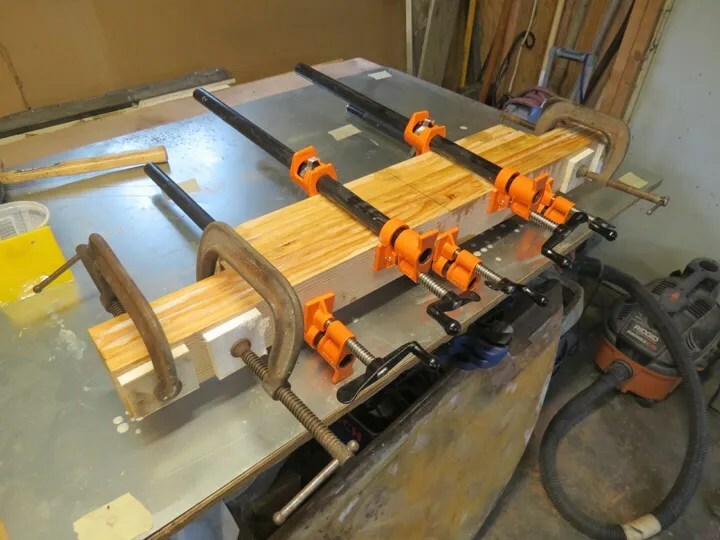 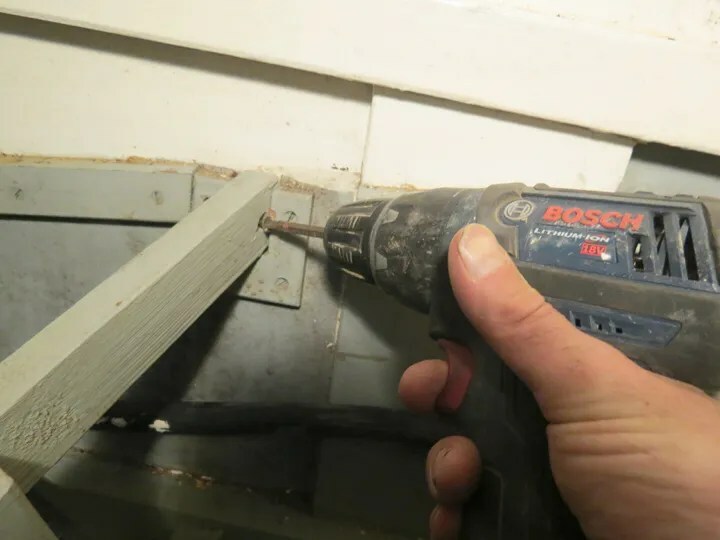 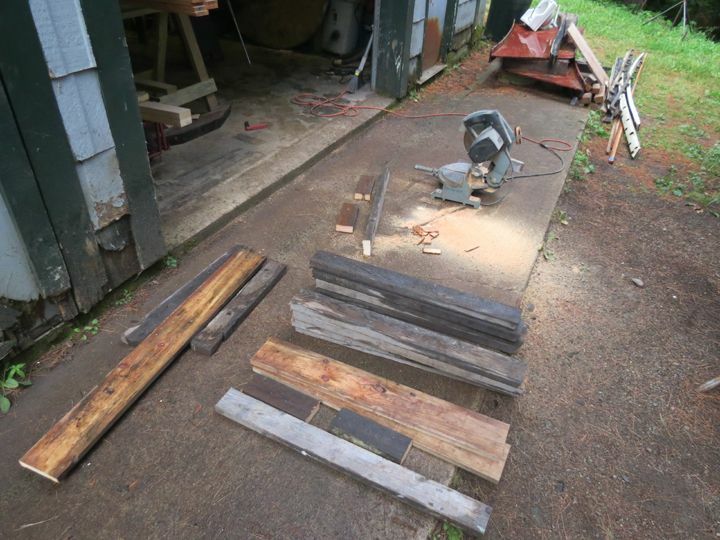 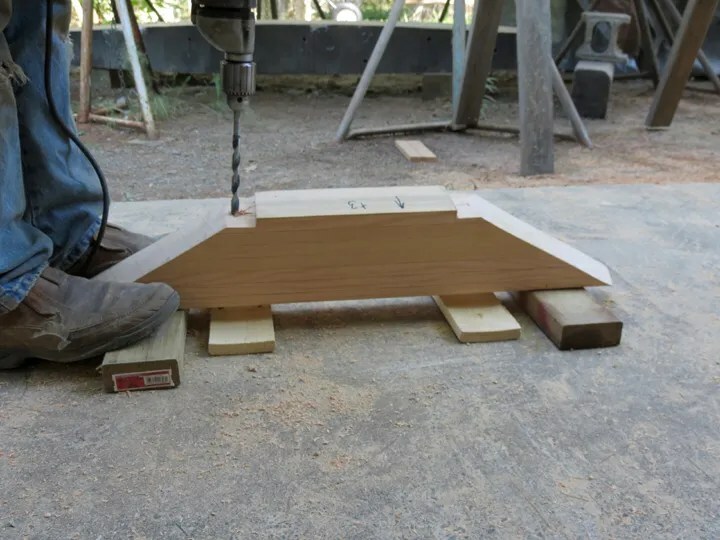 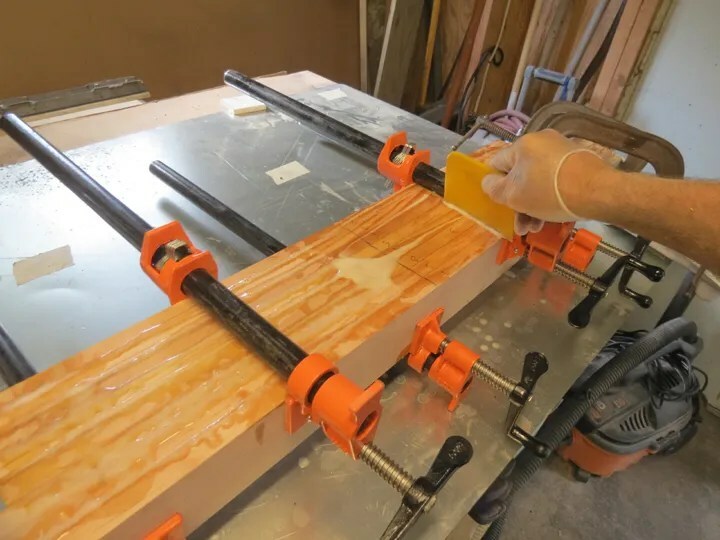 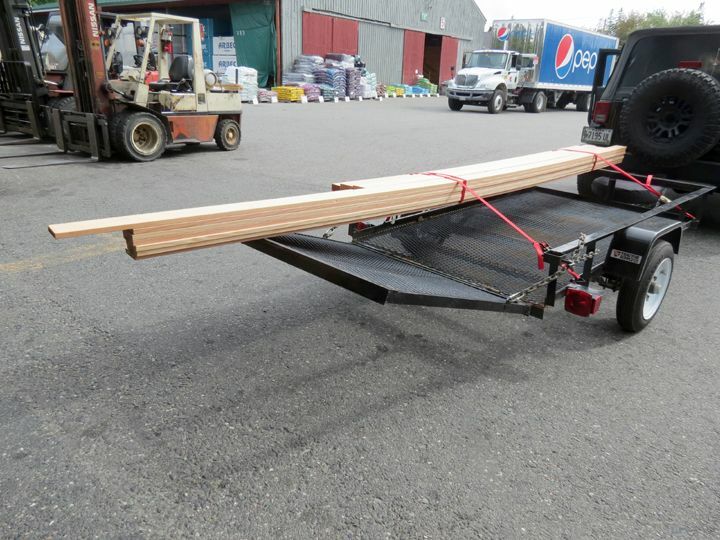 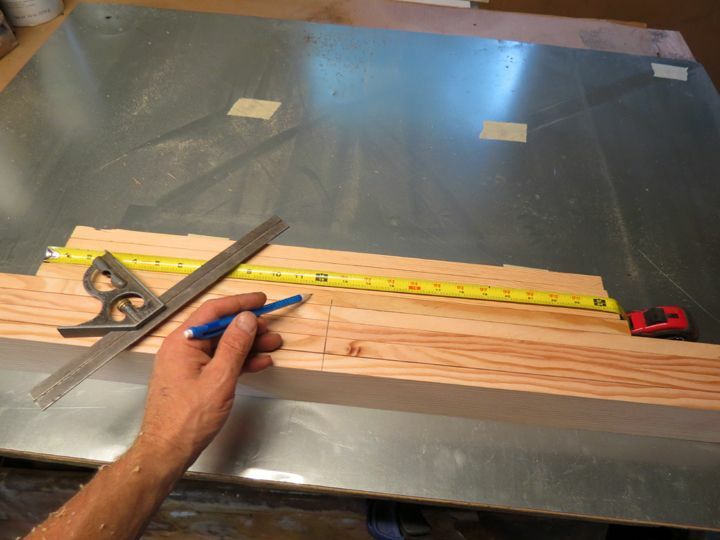 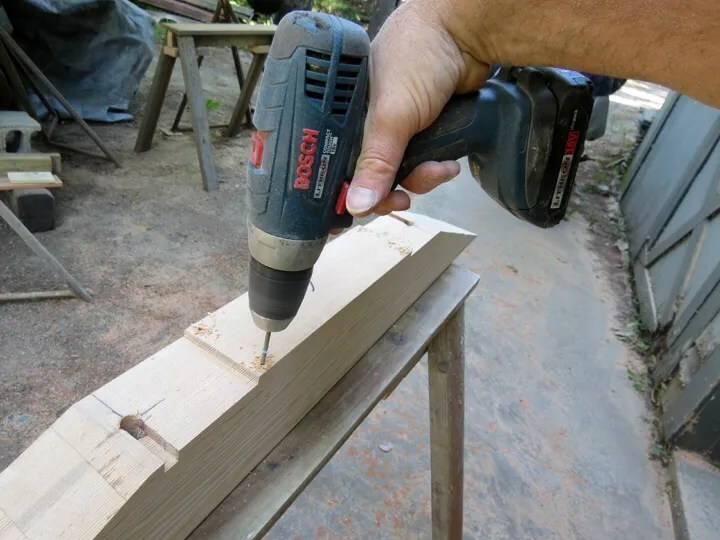 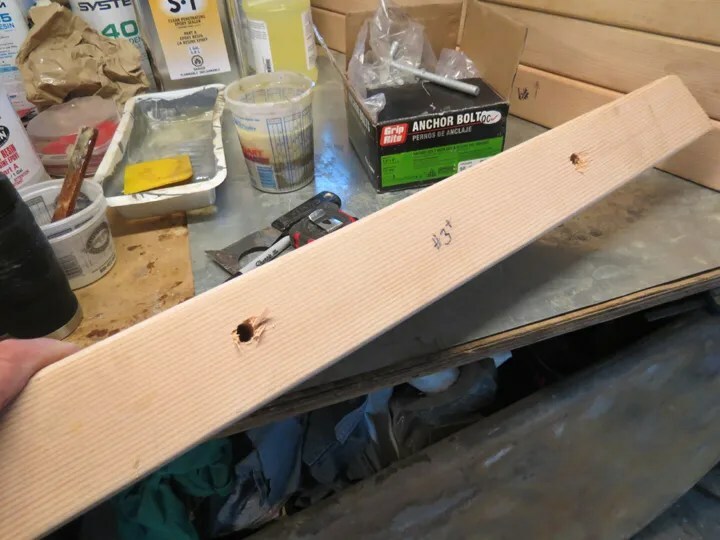 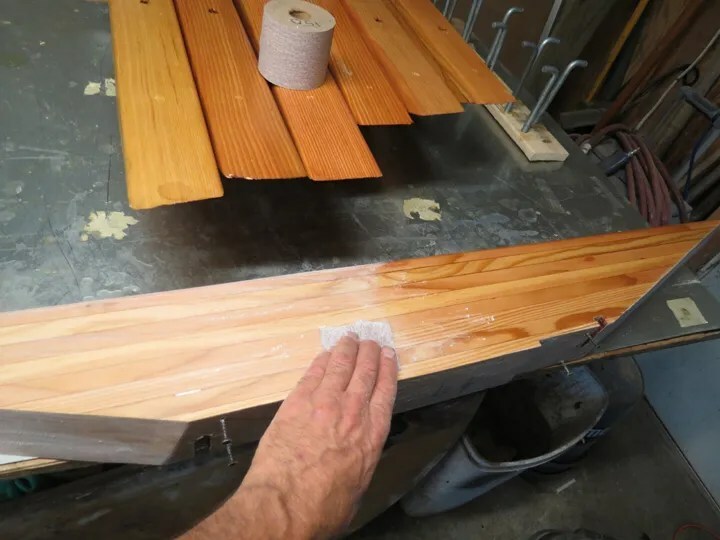 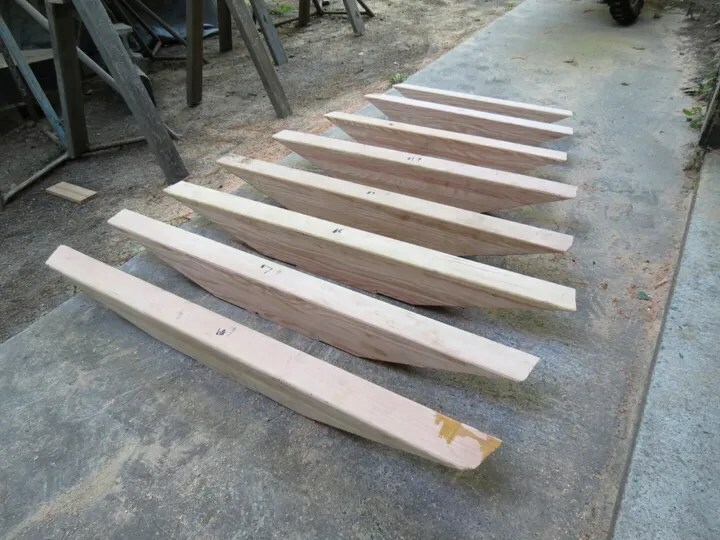 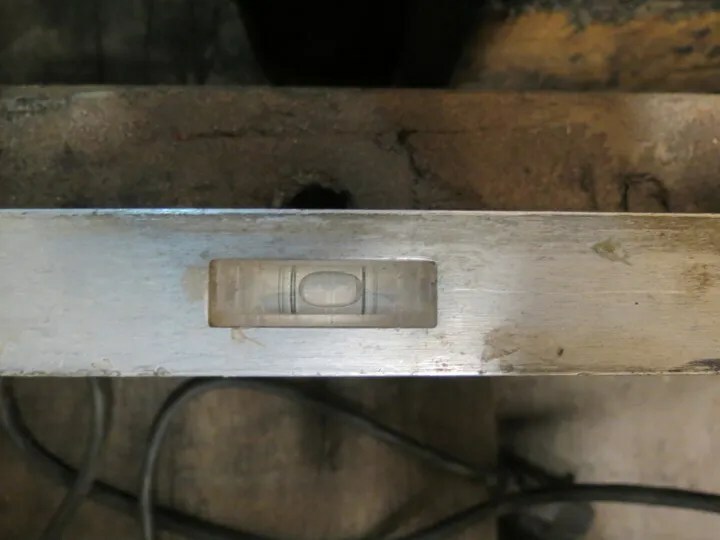 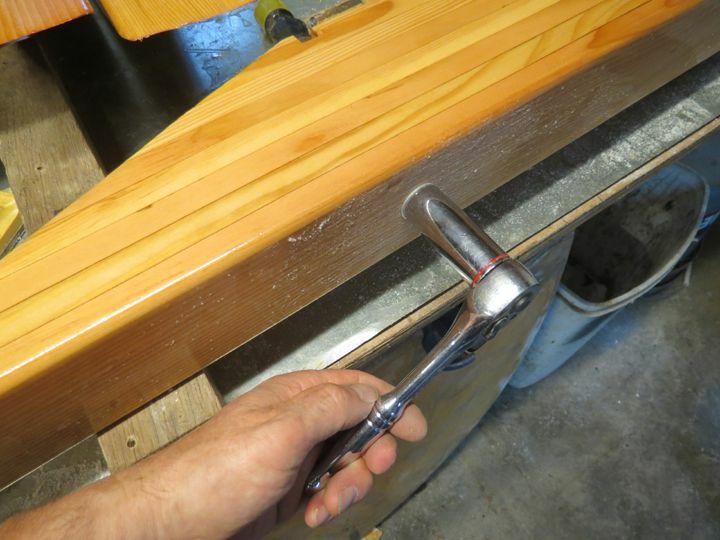 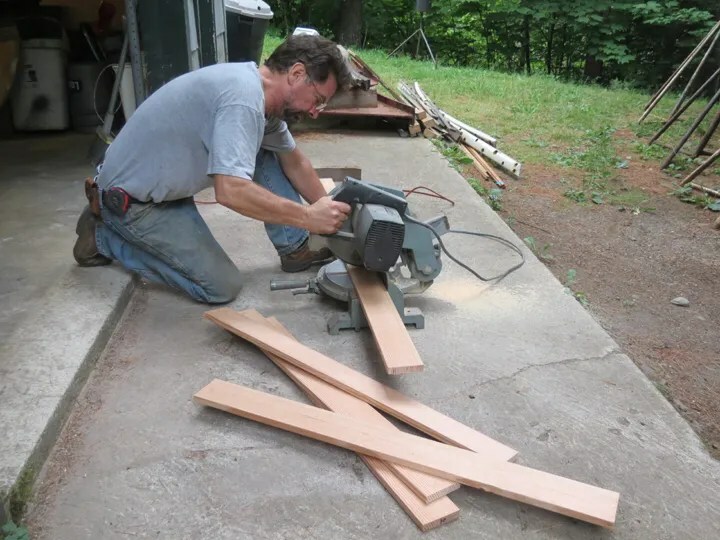 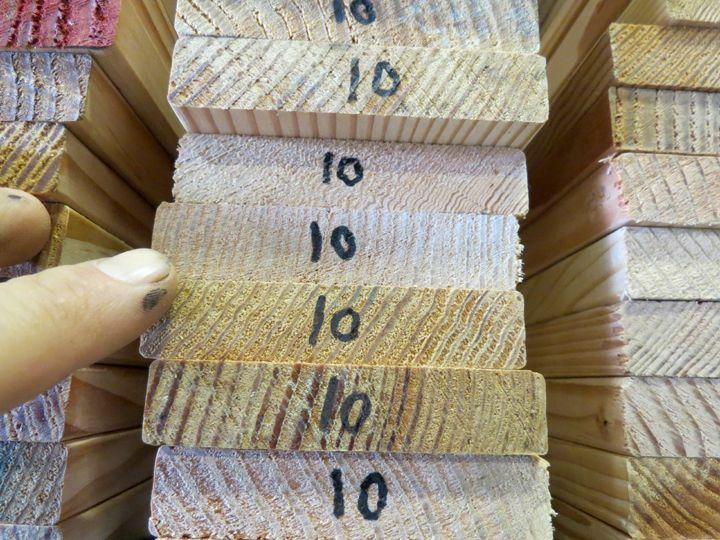 Knowing that I needed to “lift” each floor timber off of a work surface, ( While coating with CPES), I drove sheetrock screws into the base of each floor timber. 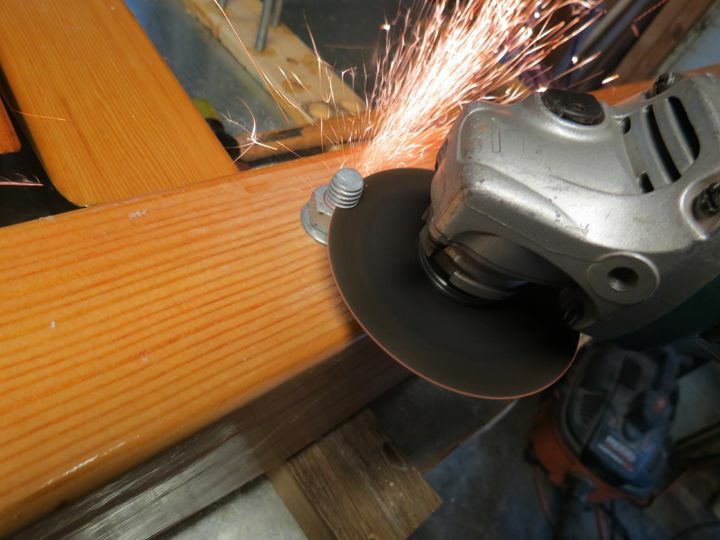 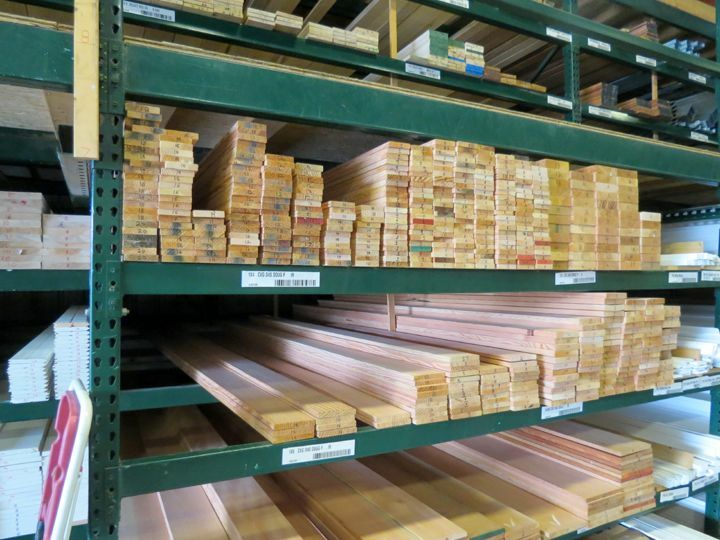 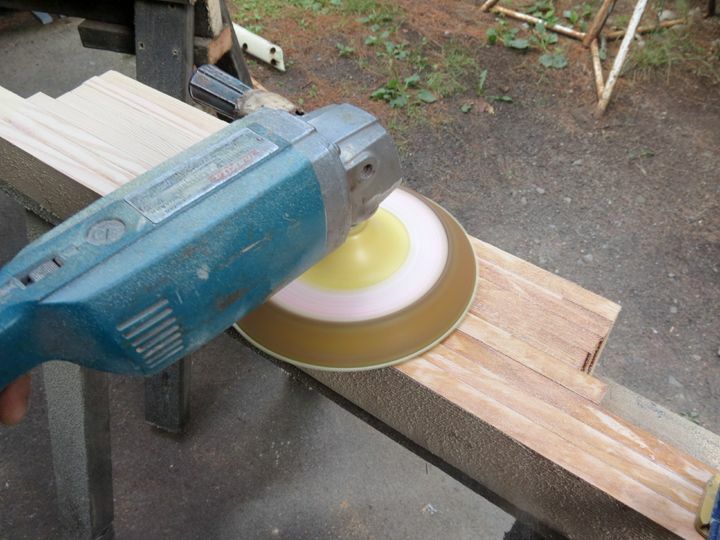 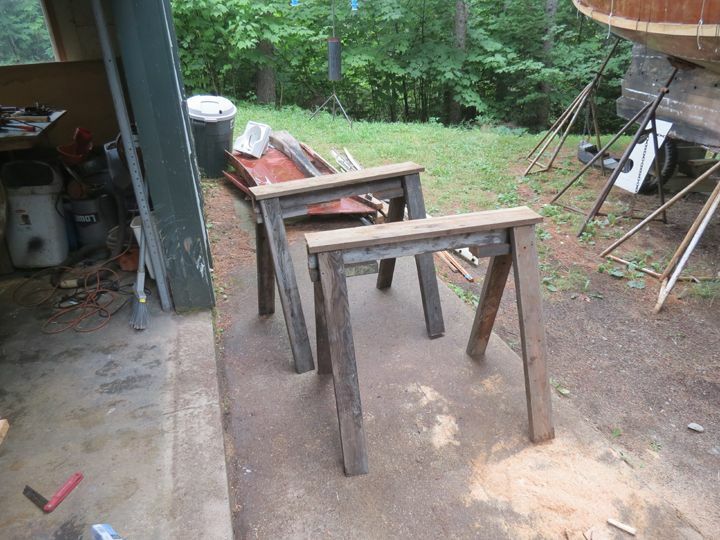 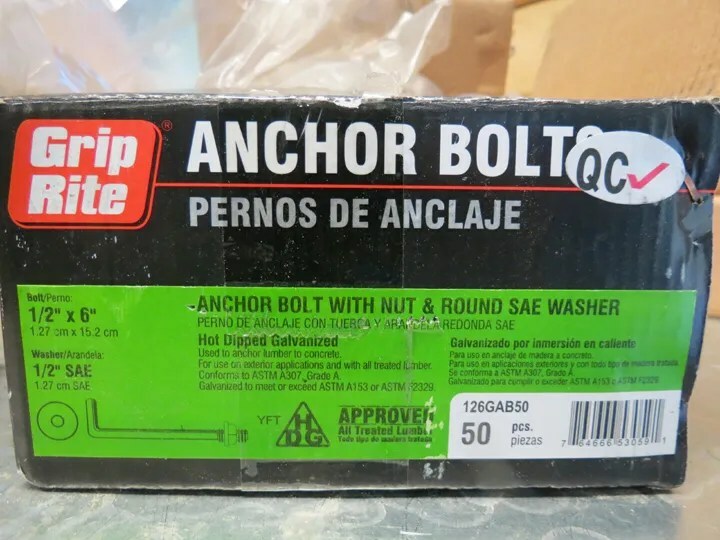 This is the product that I used to “seal” up each new floor timber that I had made. 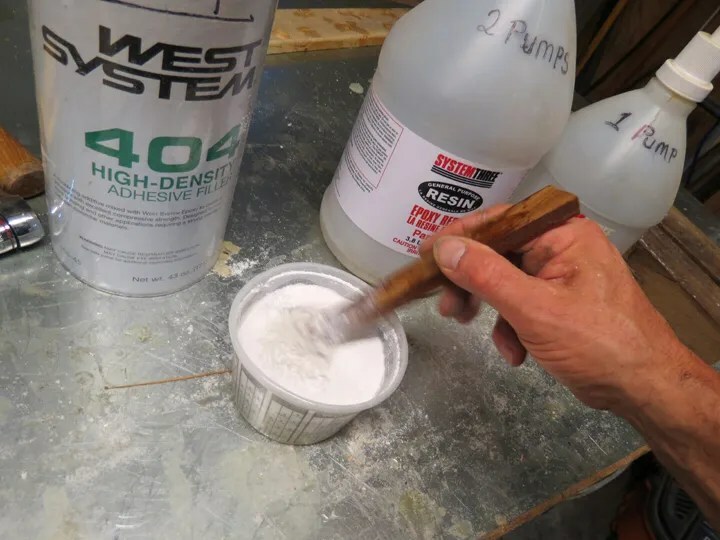 It is a “one-to-one” mix and the solution is just slightly more viscous than water. 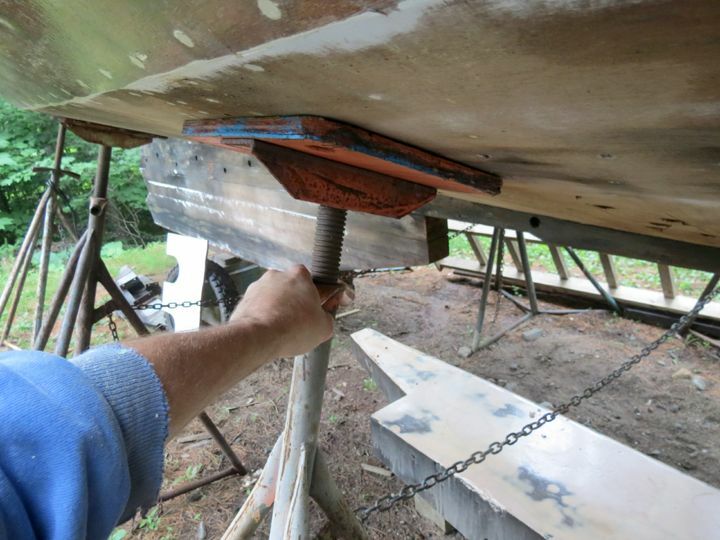 Here I am applying System Three CPES. 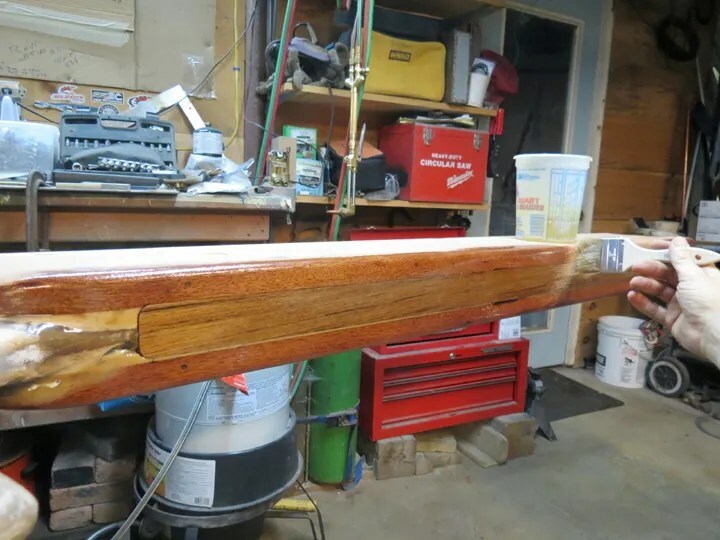 One coat of sealer complete! 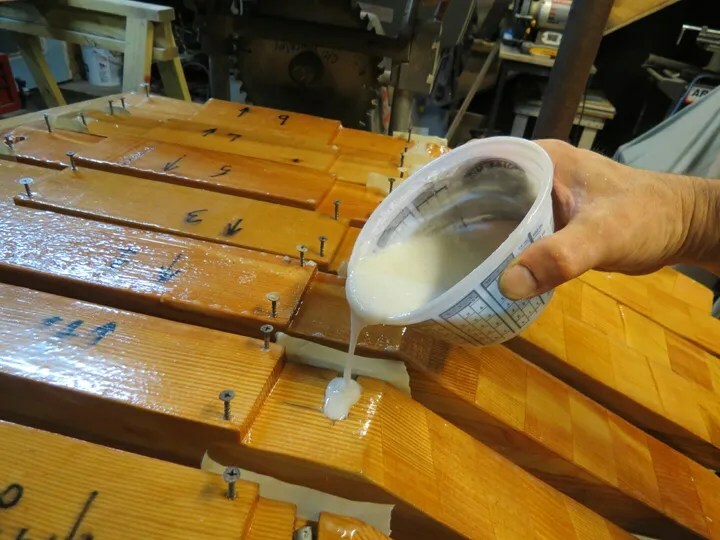 This stuff really soaked deeply into the wood! I am very pleased with this product! 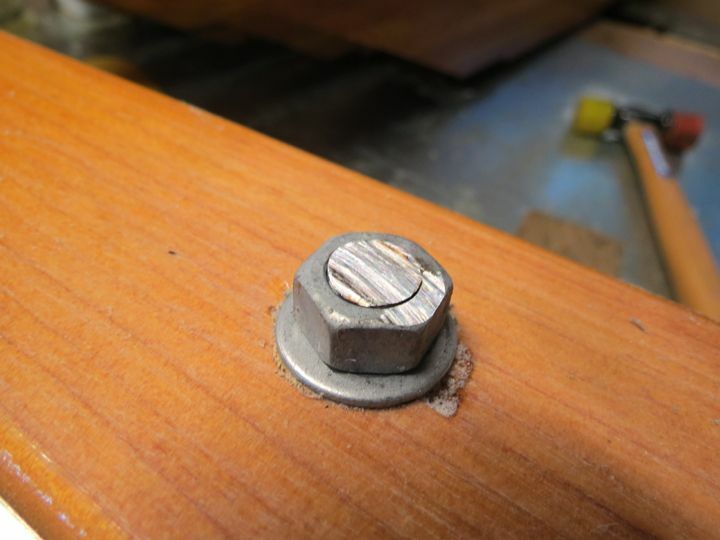 …I made the decision to add mechanical fastenings as well. 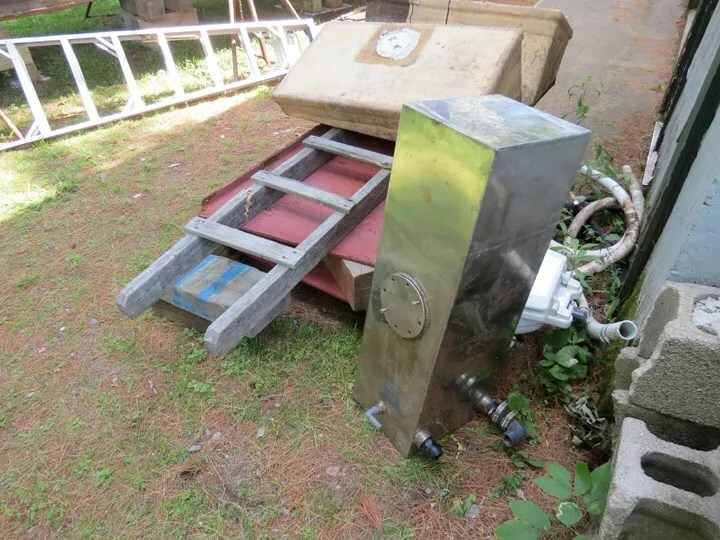 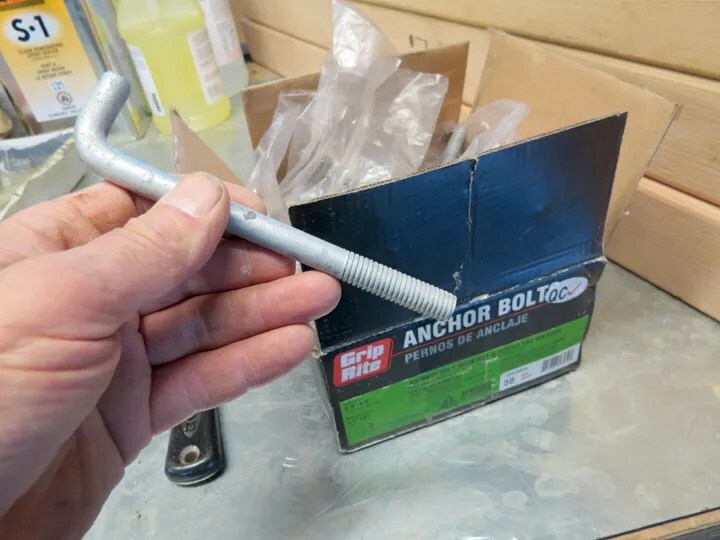 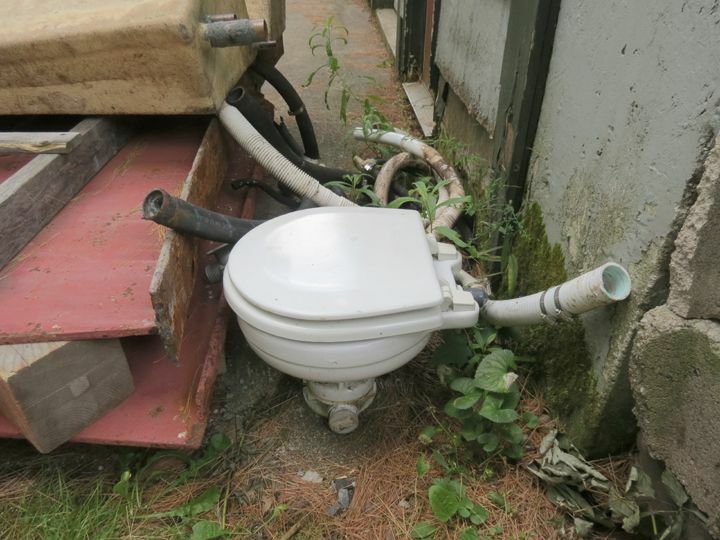 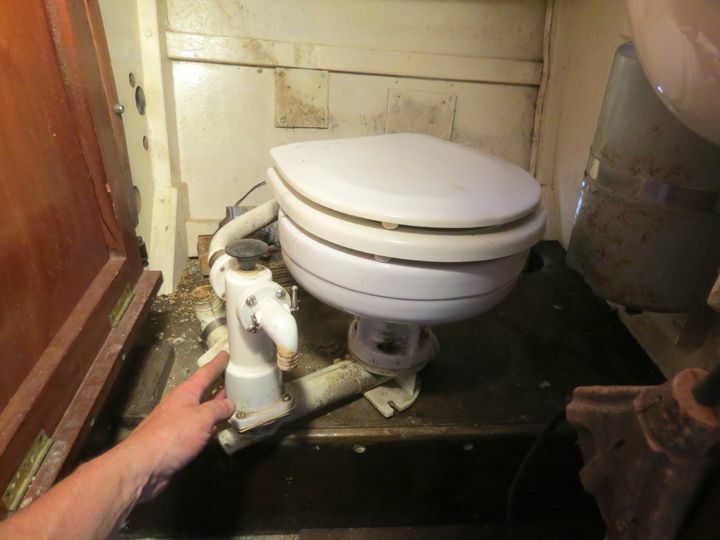 The cheapest solution that I could find was to use galvanized “anchor bolts” that I purchased at my local Home Depot store. 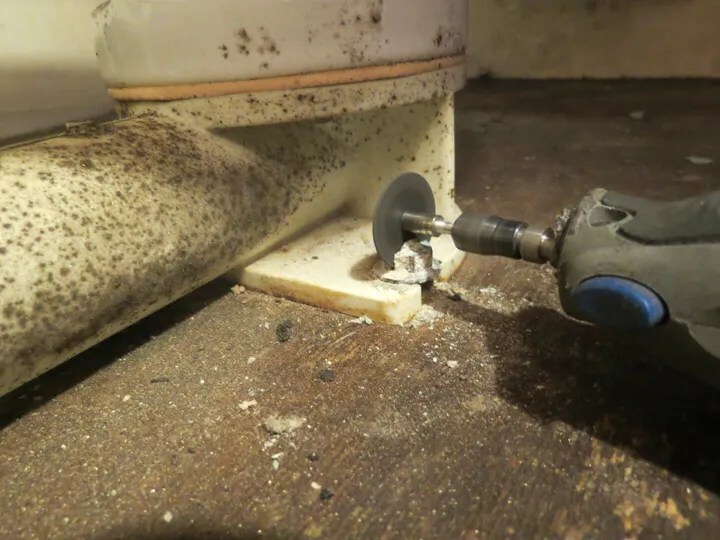 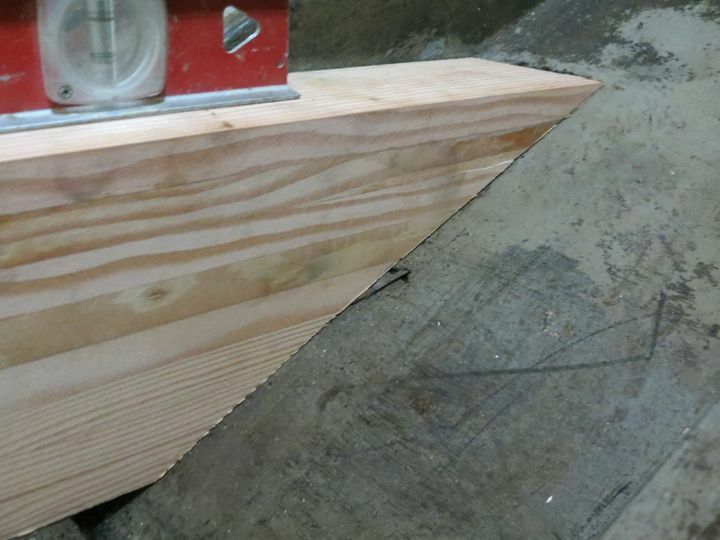 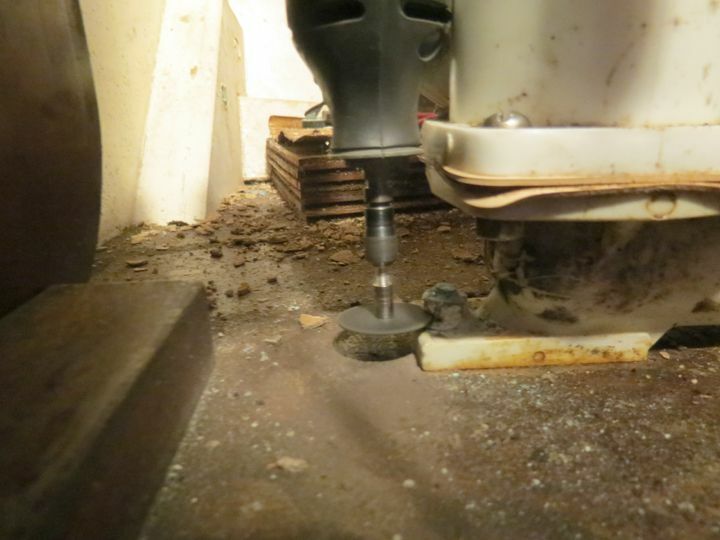 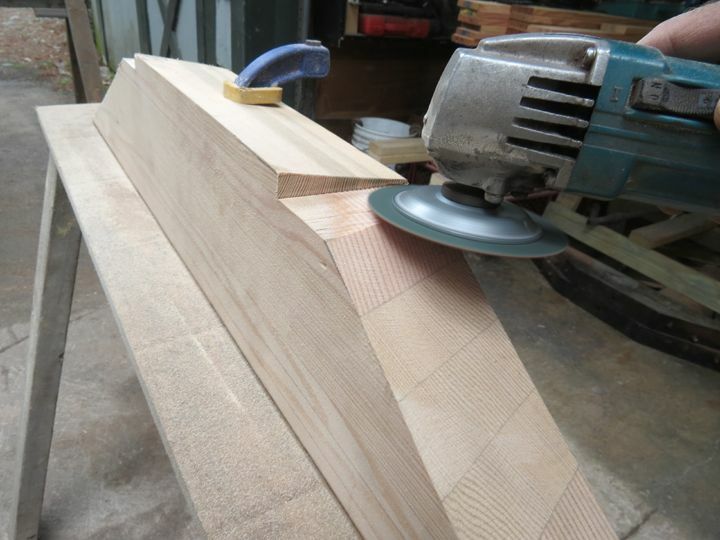 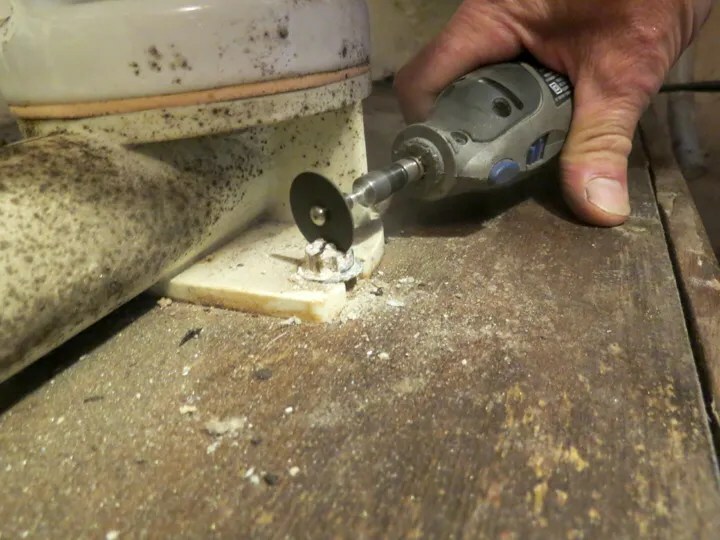 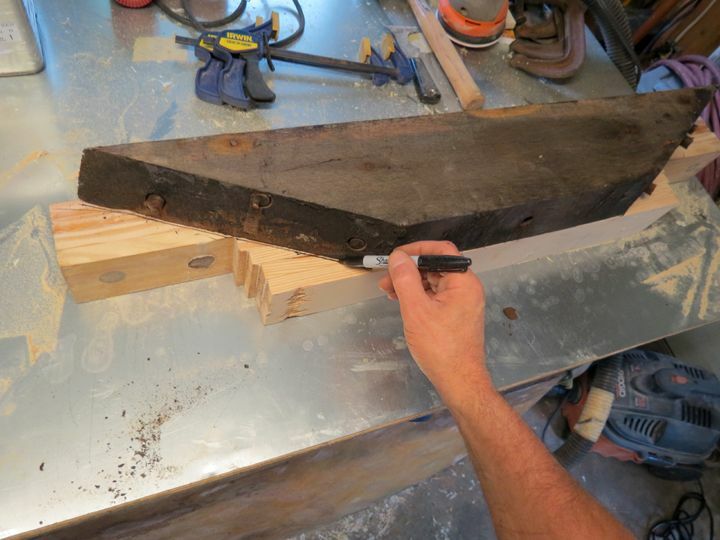 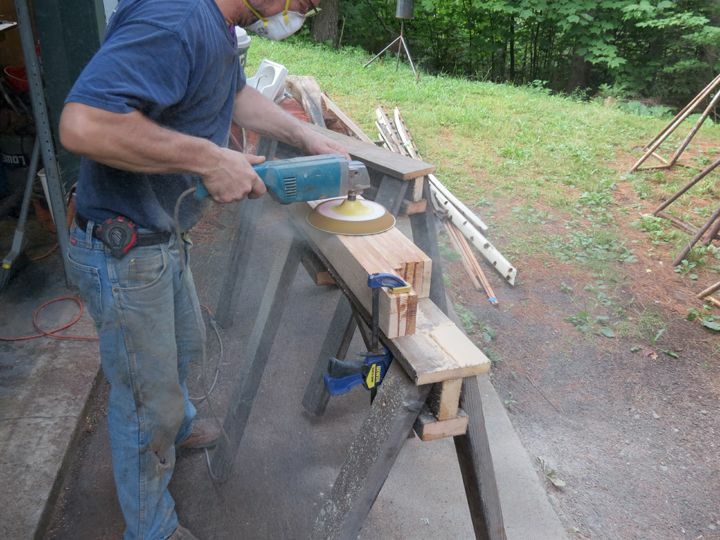 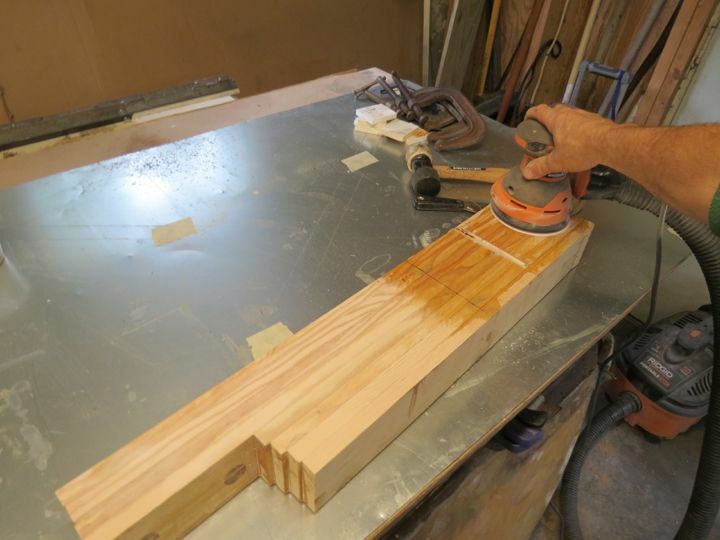 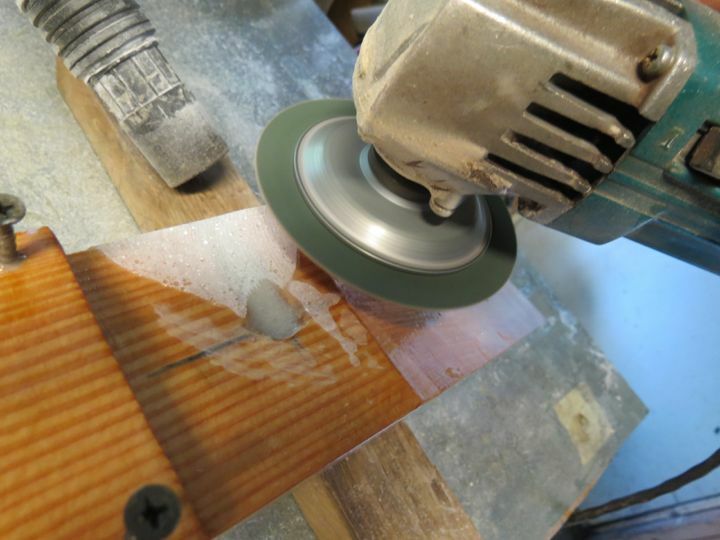 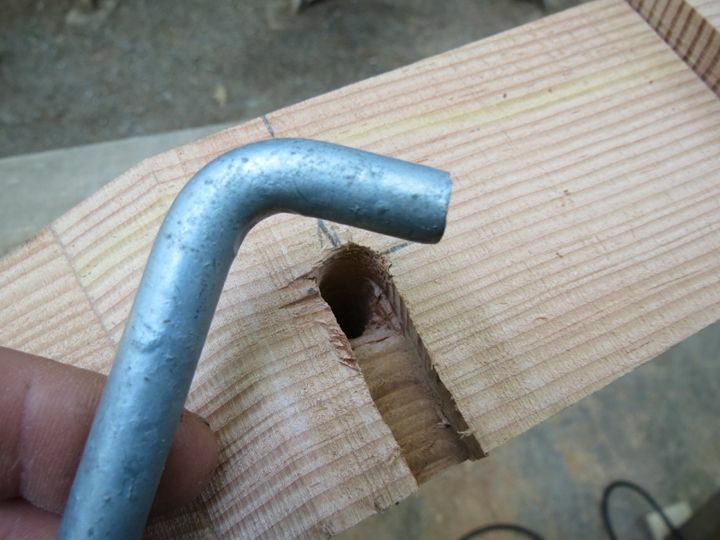 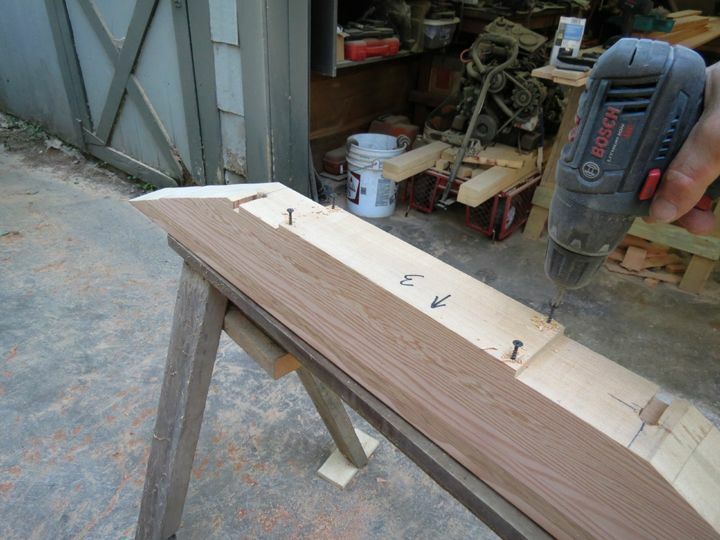 The first thing that I did was to drill down through each floor timber, using a 1/2″ auger bit. 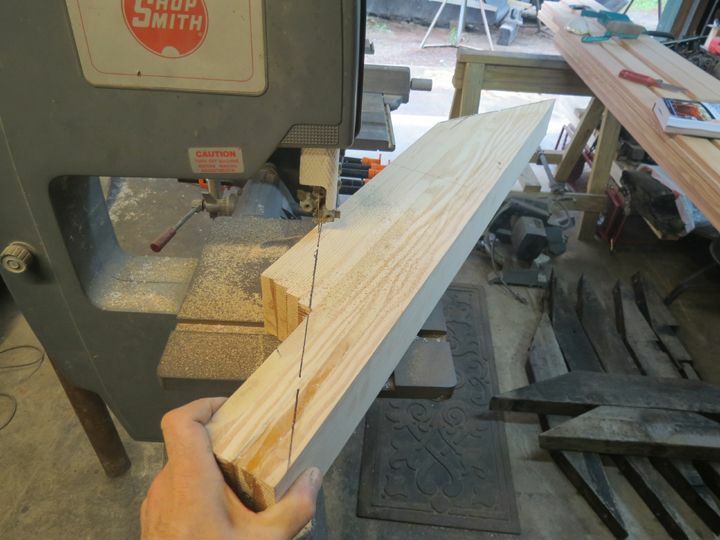 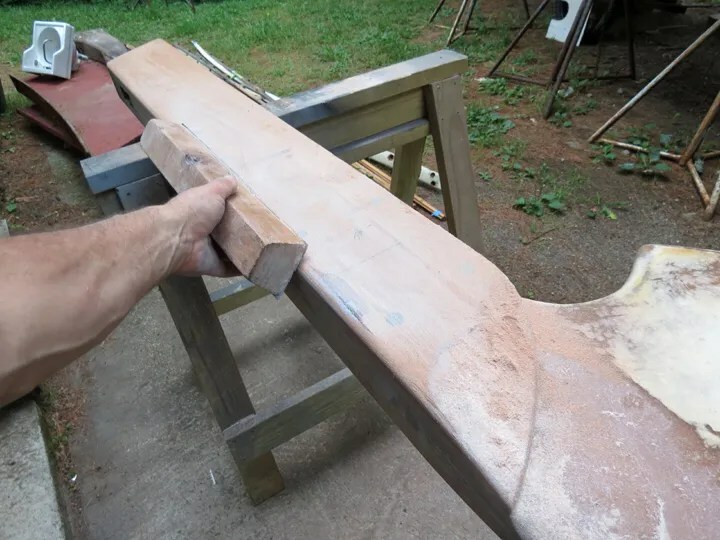 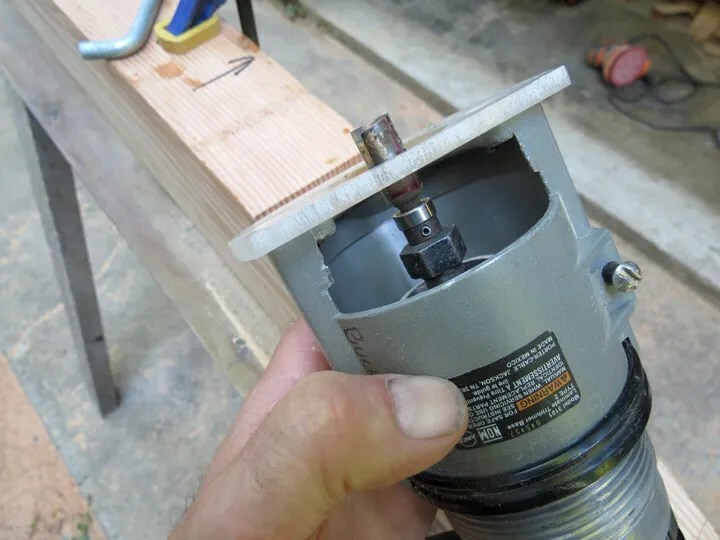 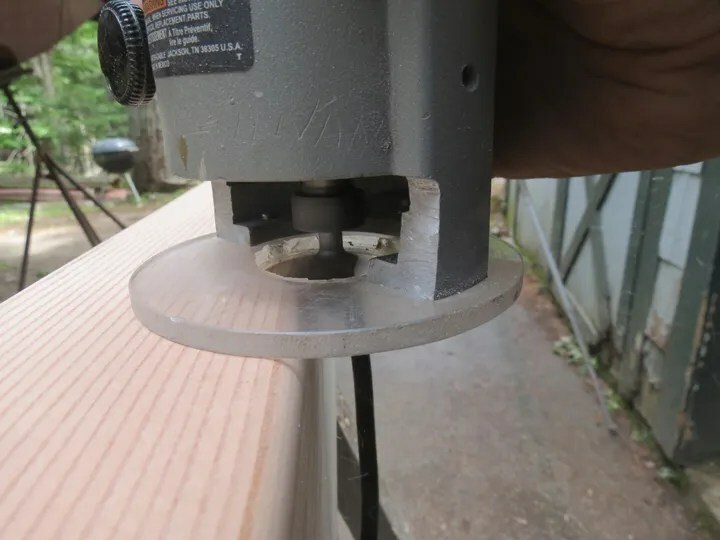 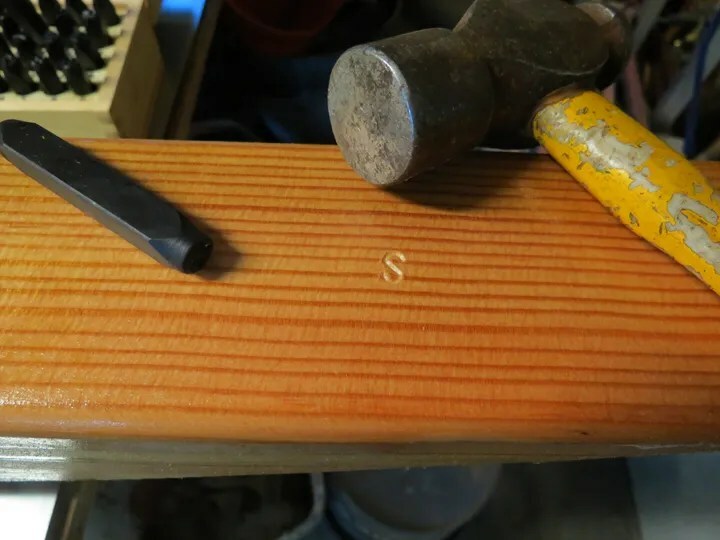 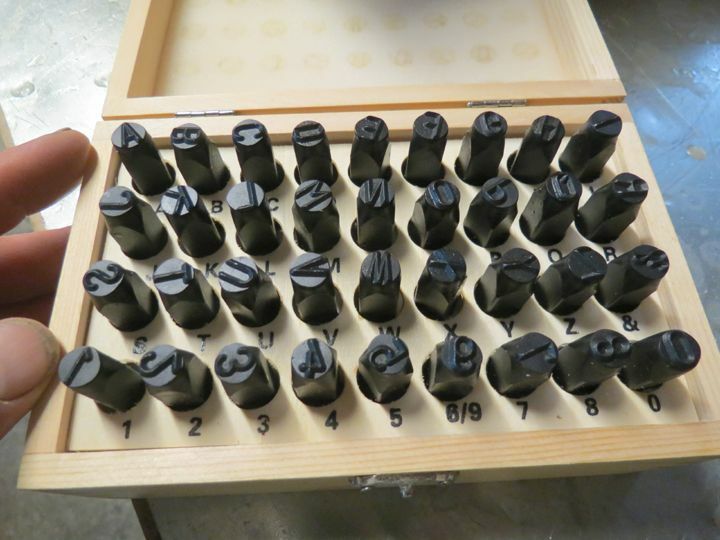 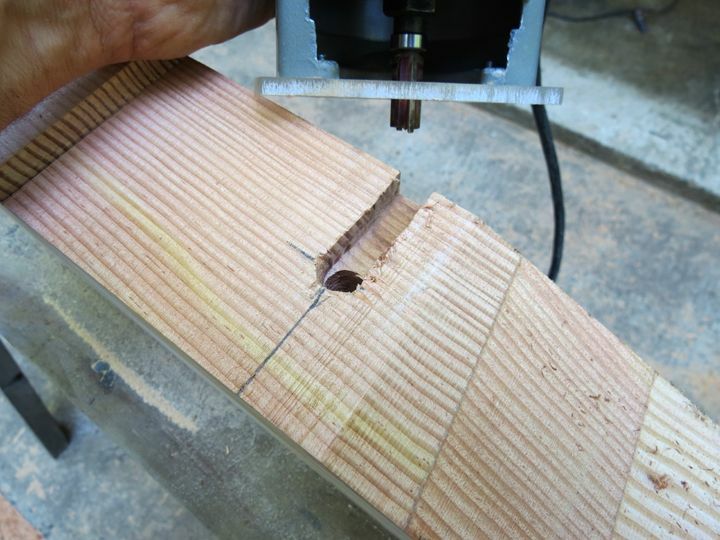 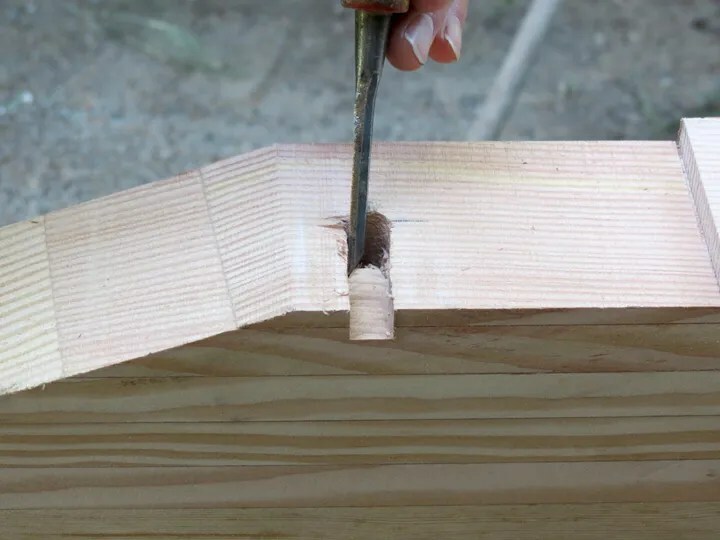 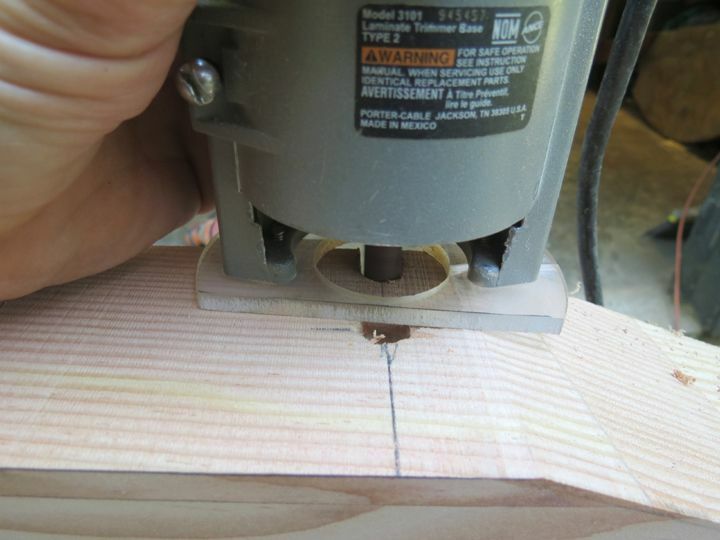 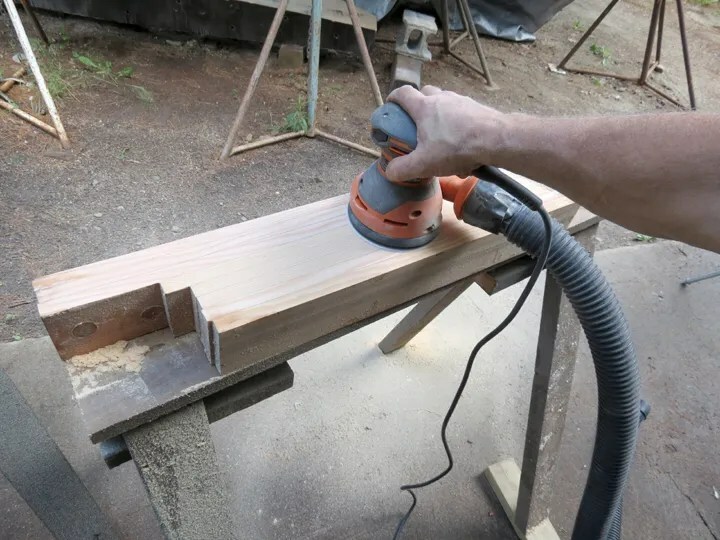 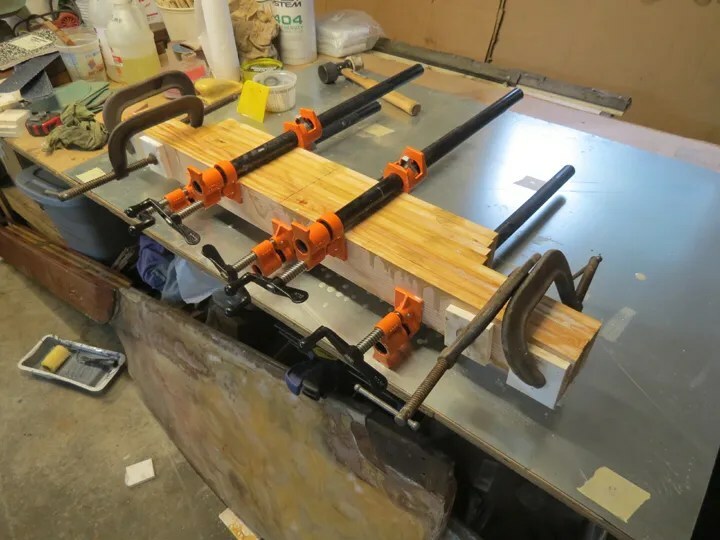 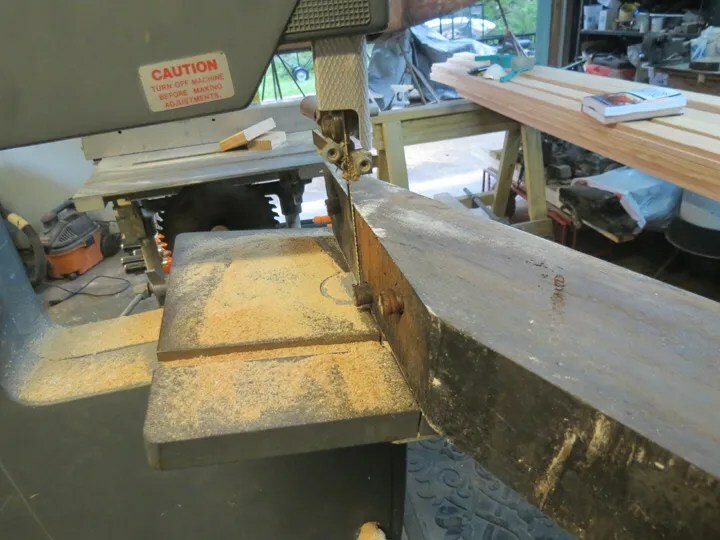 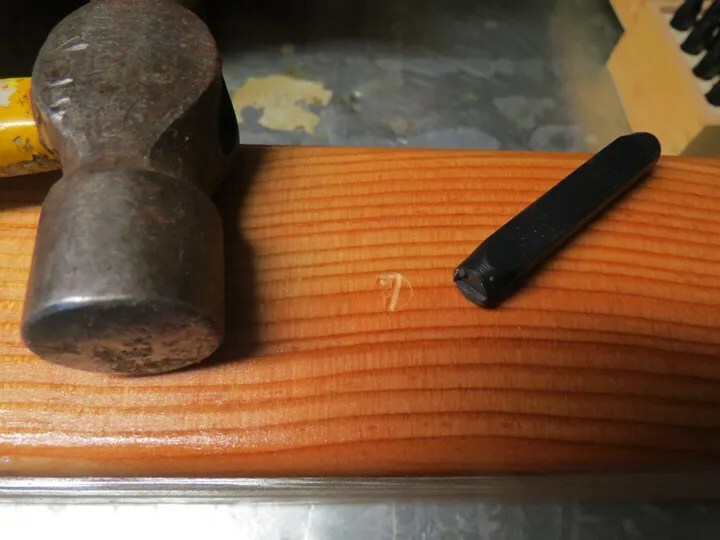 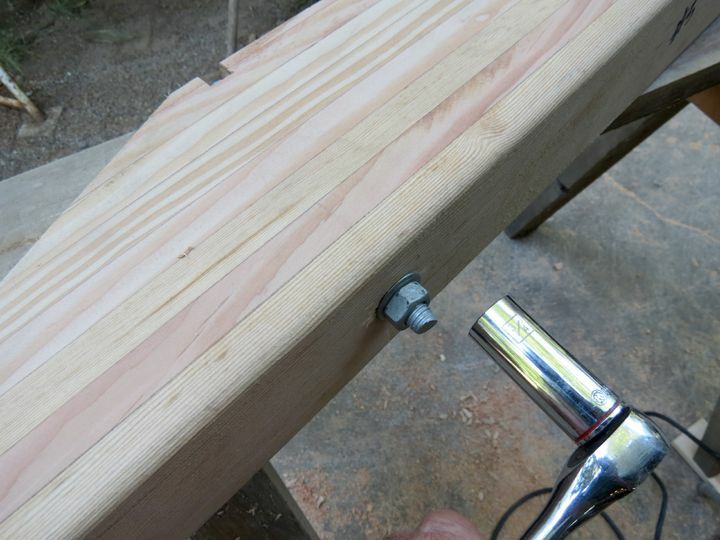 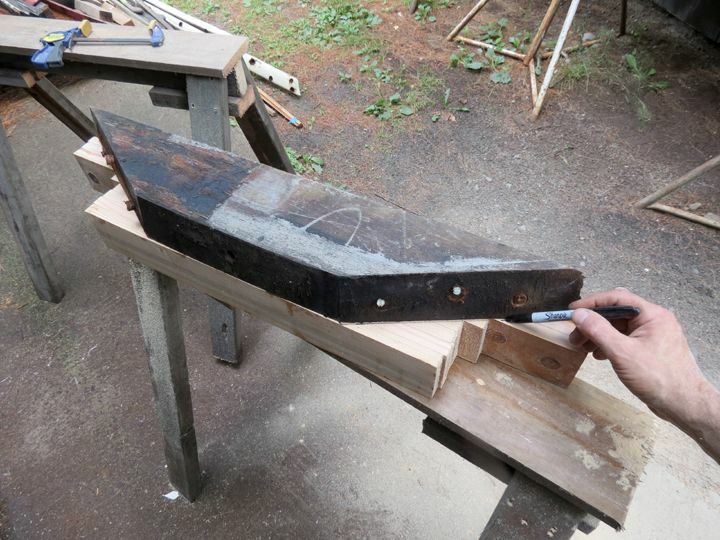 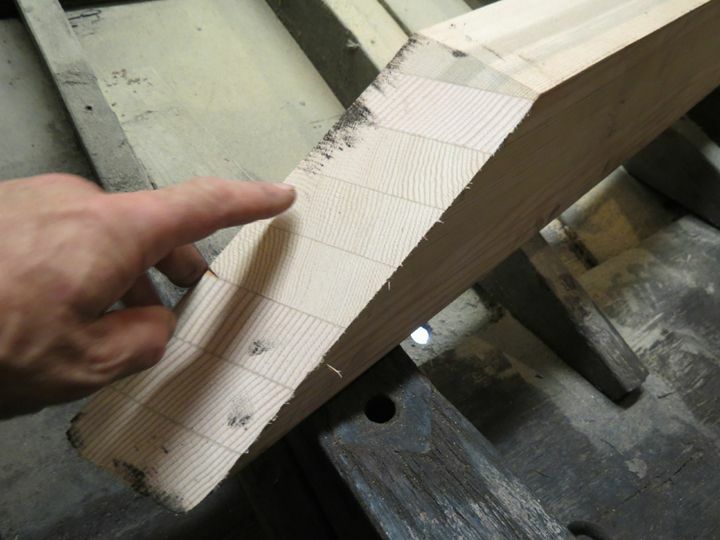 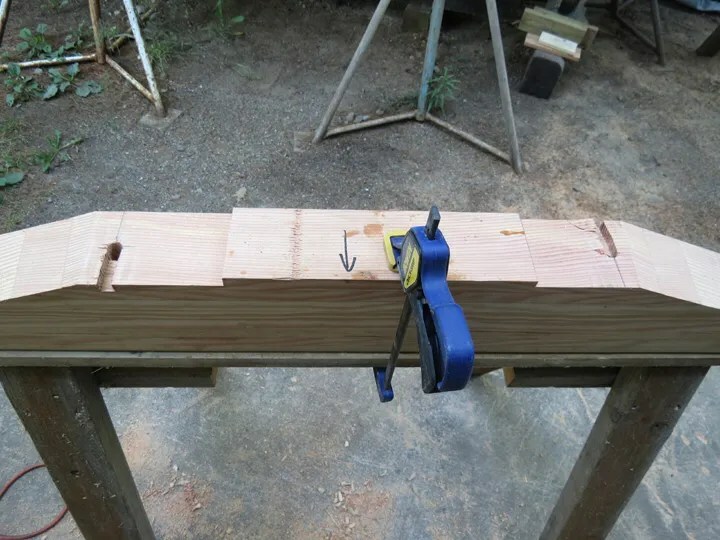 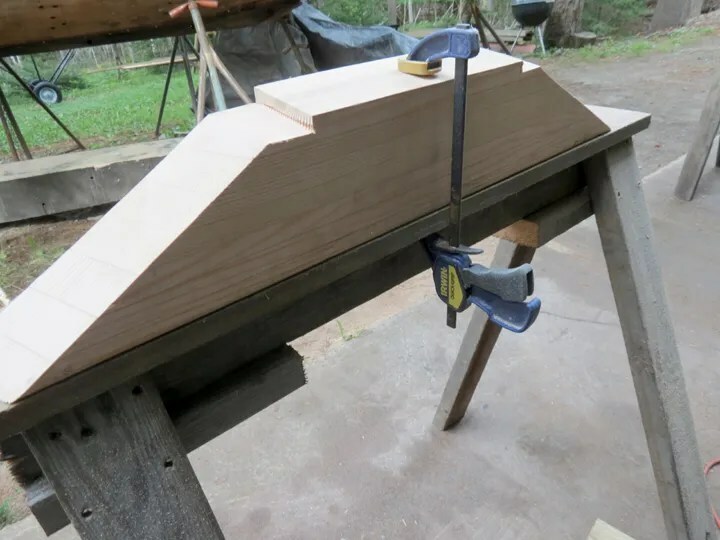 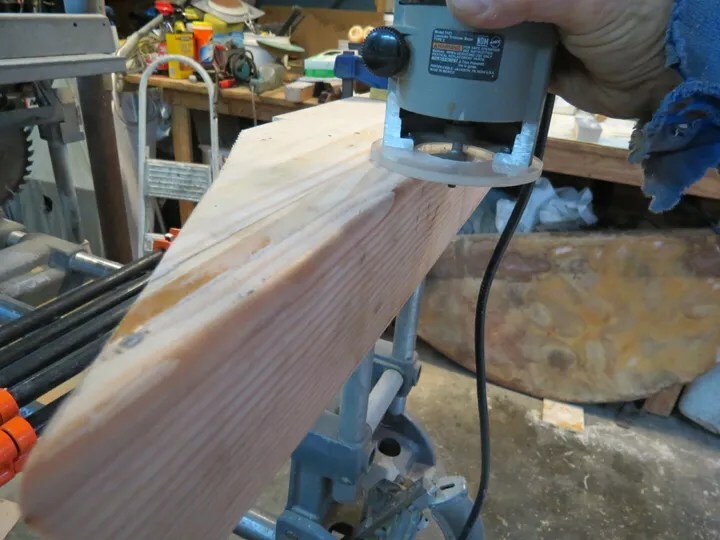 Then, using my “laminate trimmer” router, with a 1/2″ diameter bit tightened in its chuck, I carved a slot for the “heads” of the anchor bolts into each floor timber. 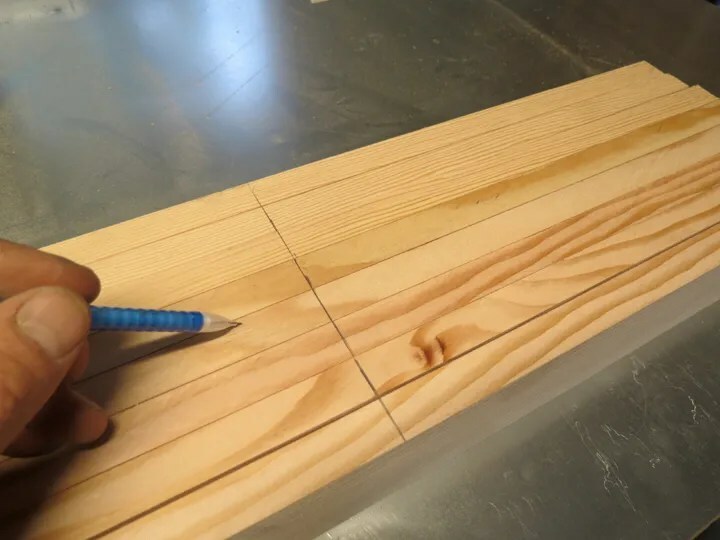 Using a chisel, I “chopped” a slight radius into the floor timber where the drilled hole, and the routed slot, met with each other. 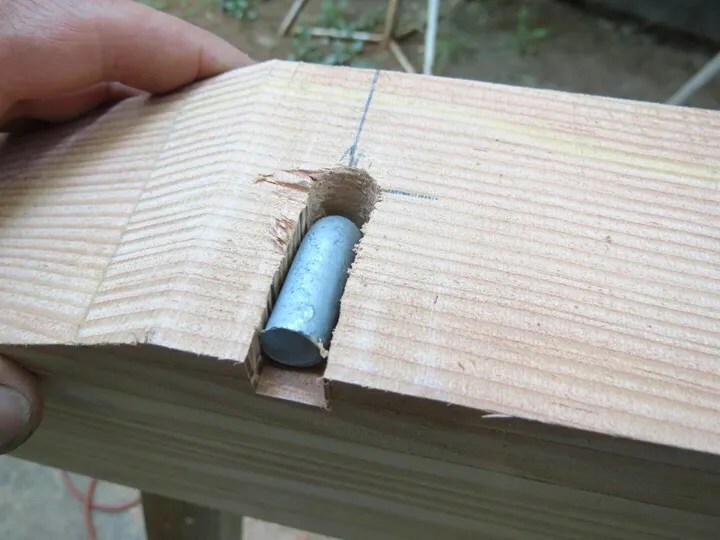 This allowed the anchor bolt to nestle down “tight” against the surfaces I drilled, and machined. I did a “dry run” of tightening up one of the anchor bolts just to see how everything worked and fit together. 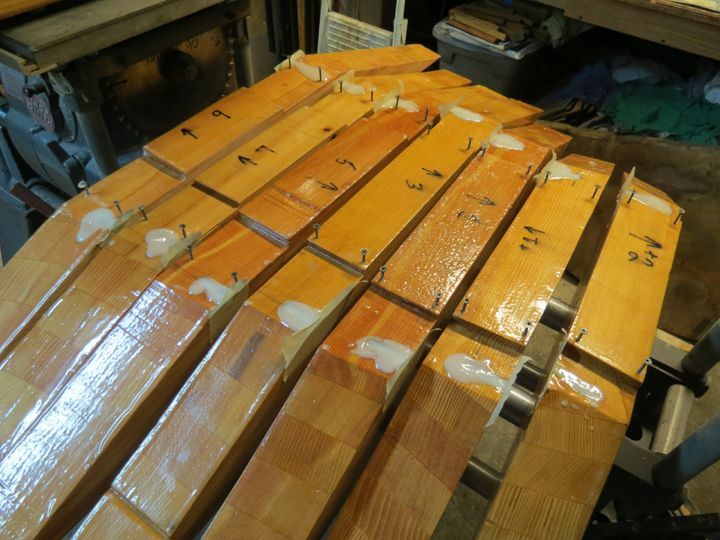 Here are all of the current batch of floor timbers all routed for the anchor bolts.